All visits to lovely towns eventually come to an end, and the best way to ease the sorrow of leaving is to have an interesting next destination to head to. And so it was when I packed up and departed the Roslyn Apartment, back in the car for the northward part of my road trip. 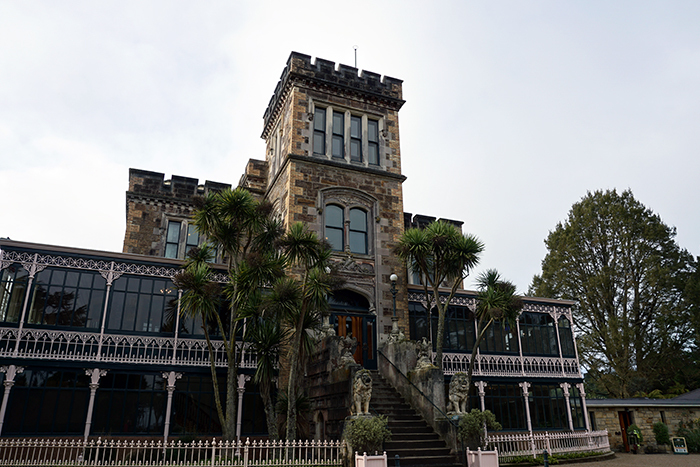 So I drove to the Larnach Castle which is New Zealand’s only castle and seemed like a novelty to check out. 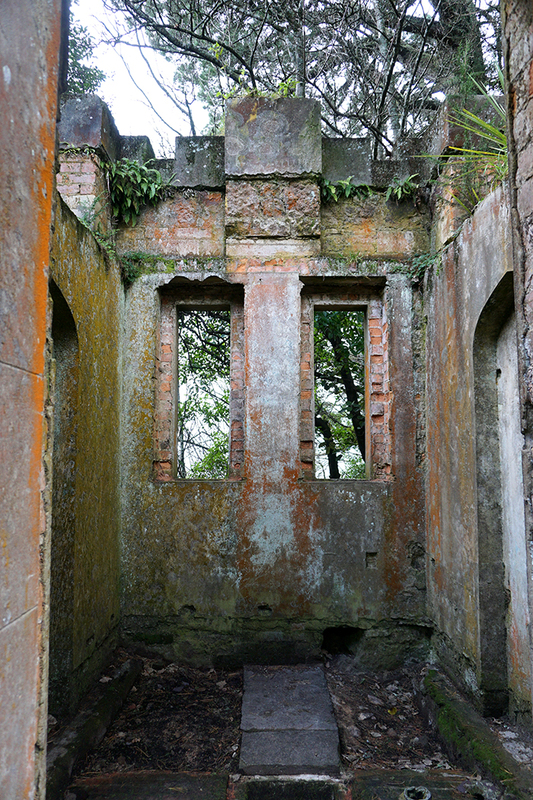 The castle was built in 1871 by William Larnach, a banker and politician, for his first wife Eliza. 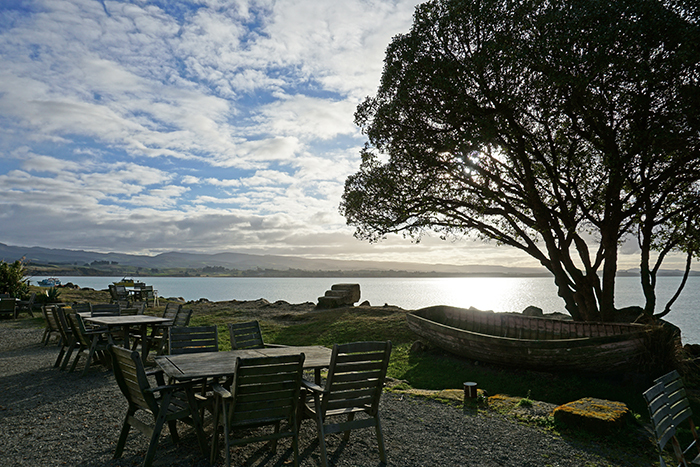 He and one of his sons were horseriding on the Otago Peninsula when they chose the site for the castle – it’s easy to see why they chose it! It took more than 200 workmen three years to build the Castle and a further 12 years designing and furnishing the interior. William’s story is quite tragic. His first wife Eliza had all six of Lanarch’s children and then sadly died at the age of 38. He later married her half-sister who died five years – also aged 38! 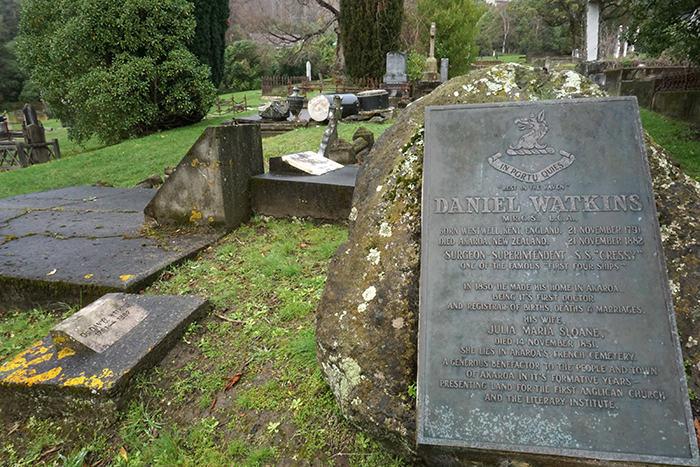 His oldest daughter passed away in her twenties, he remarried one more time but then tragically took his own life in the New Zealand Parliament Buildings in 1898. The family struggled after this and sold the castle in 1906. The current owners bought the castle in 1967. 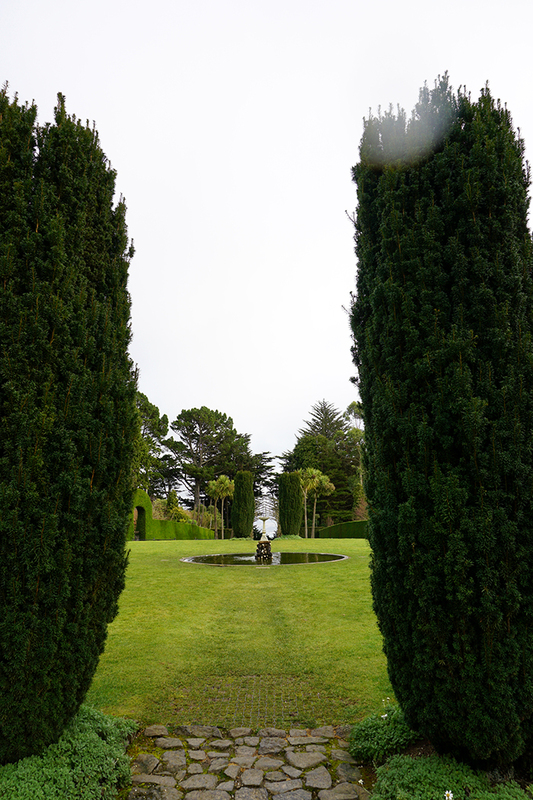 I paid the small fee to enter the grounds and explore the gardens which were quite charming. 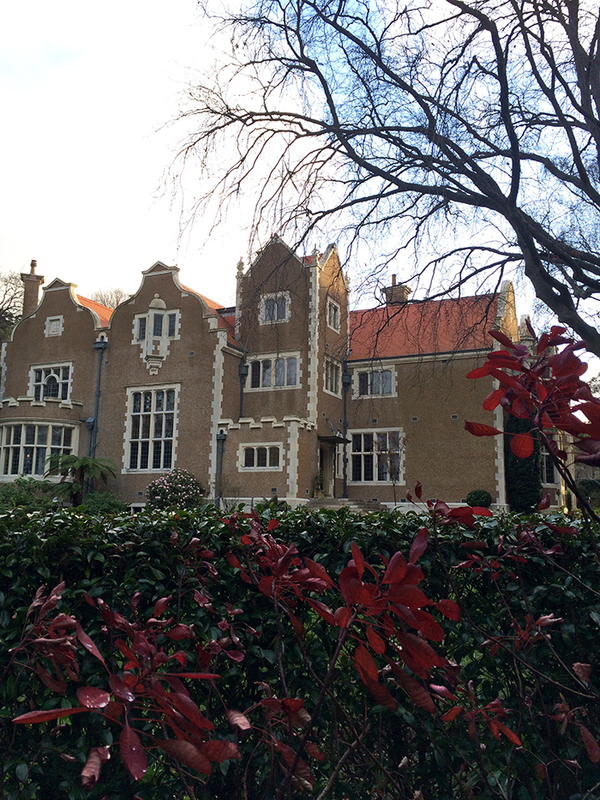 I opted not to pay for entry to the castle as I was short on time and had already gotten my fill with the Olveston House visit. I did visit the tea rooms though and enjoyed coffee and fresh scones. 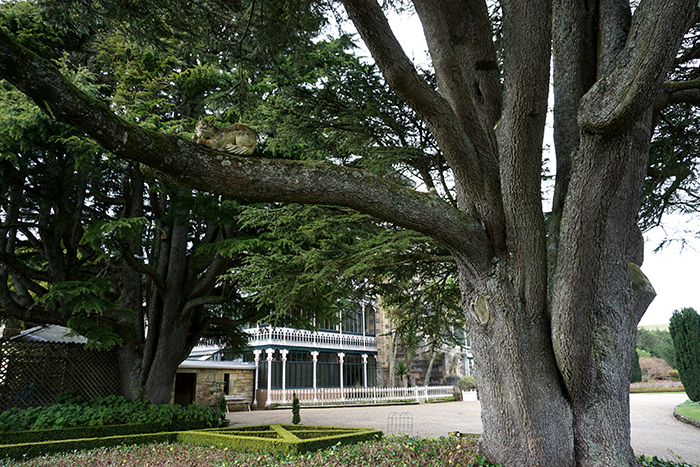 The grounds have a few little Alice in Wonderland influences hidden in crooks and crannies, such as a Cheshire Cat in a tree. 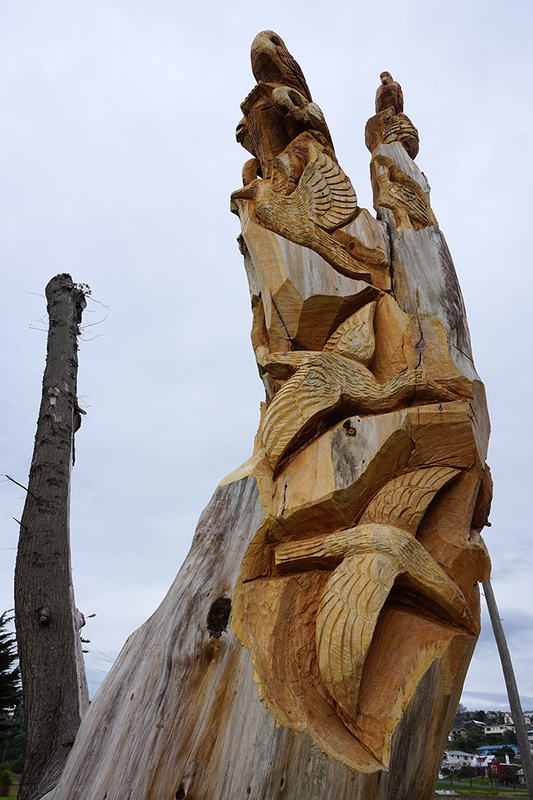 I later learnt that it is a tribute to the New Zealand reference made in Lewis Carrol’s famous work. 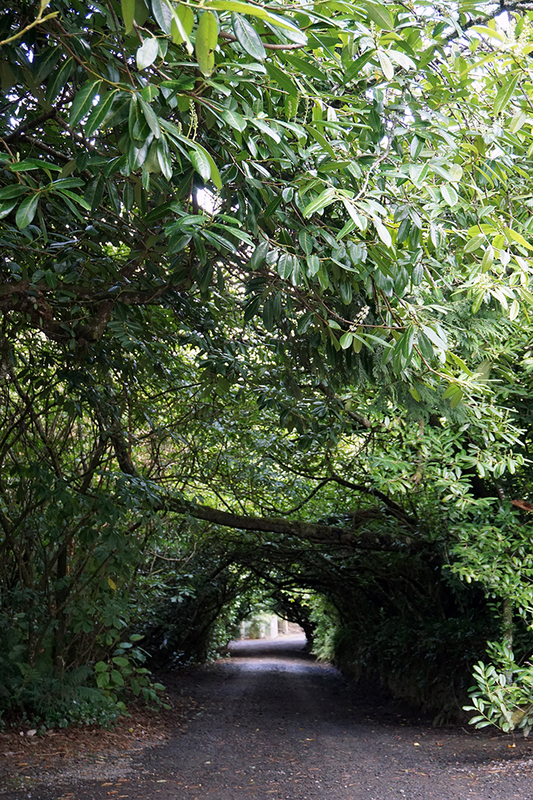 The grounds actually reminded me more of another classic book, one I was a bigger fan of as a child – The Secret Garden. 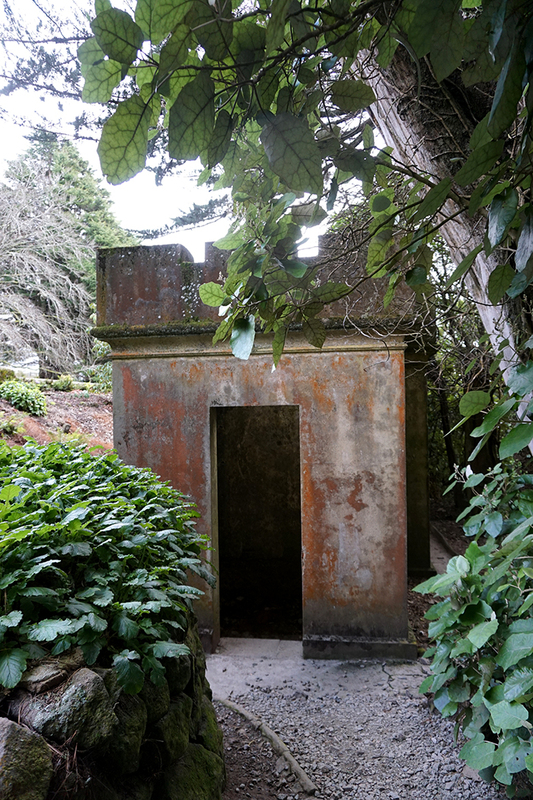 There were so many nooks and hideaways around the gardens, some felt like they were all but forgotten until I stumbled on them. 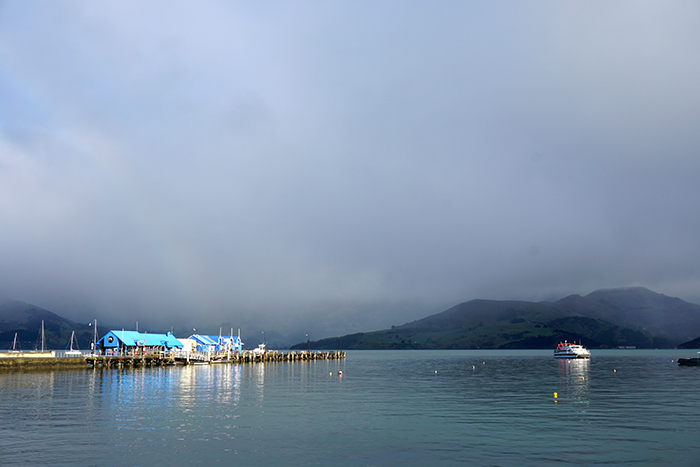 Time to depart as the day was pressing on and I had a 5+ hour drive to Akaroa. 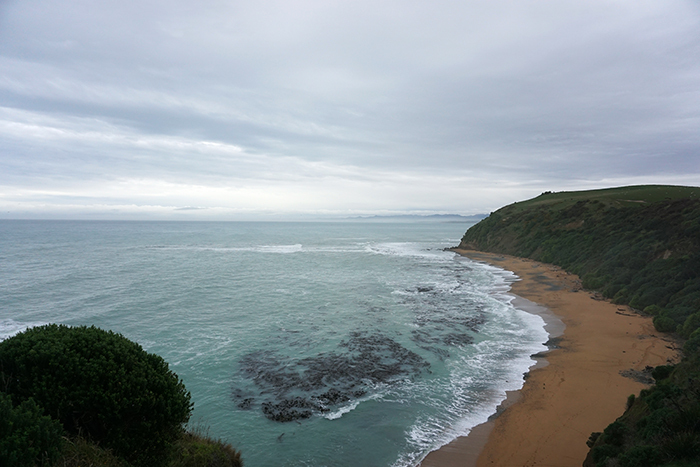 I left the Otago Peninsula with a few sneaky detours down some dirt roads to the coastline and stops by the roadside to snap some pics. 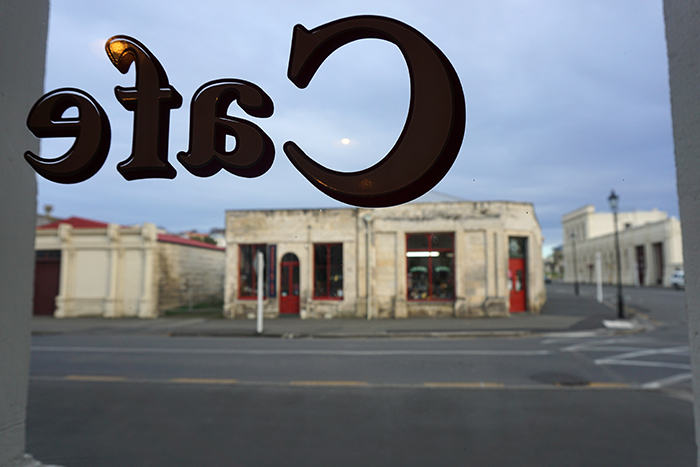 My good friend Leah, a pal I met while travelling in India and who I caught up with in Auckland, told me about a great restaurant called Fleur’s Place which she highly recommended I visit as I was passing. WOW – I’m so glad I did! 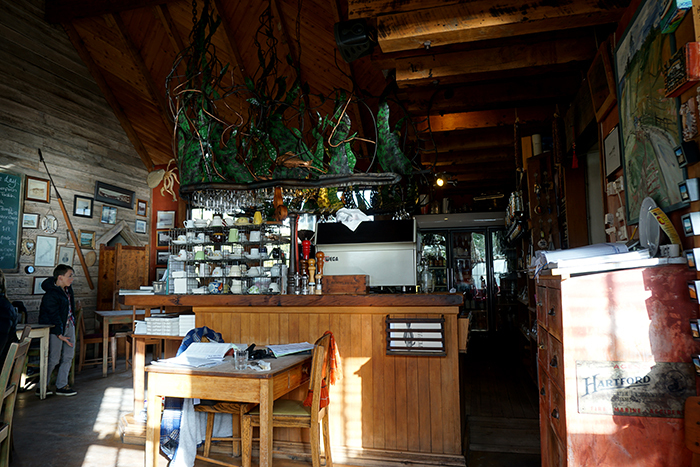 It is a small cosy ocean side restaurant at Moeraki. While there I saw books on the shelf that had a photo on the cover of the smiling woman who greeted me – Fleur Sullivan. I thought she must be someone interesting to be on the cover of a book so I did some Googling. This interview reveals a fascinating and inspiring woman! 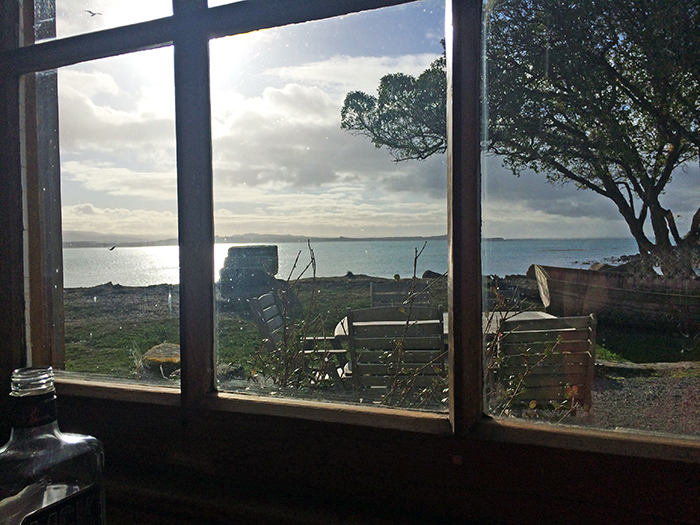 I sat inside by a pretty window and enjoyed a delicious seafood chowder and fresh bread. 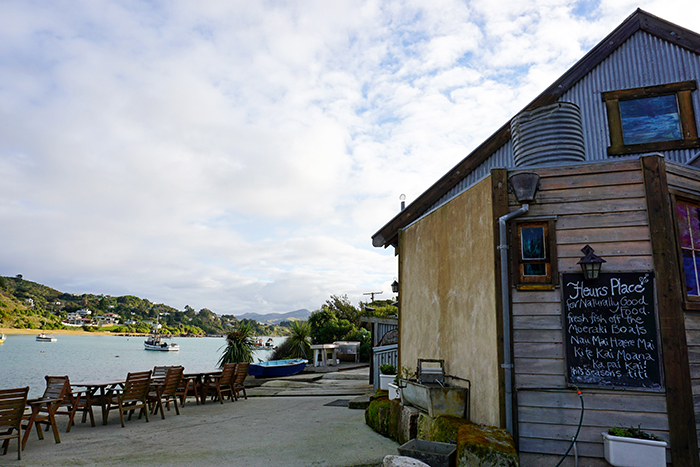 The restaurant is located on right on the water – like, water on three sides! It was incredibly pretty. 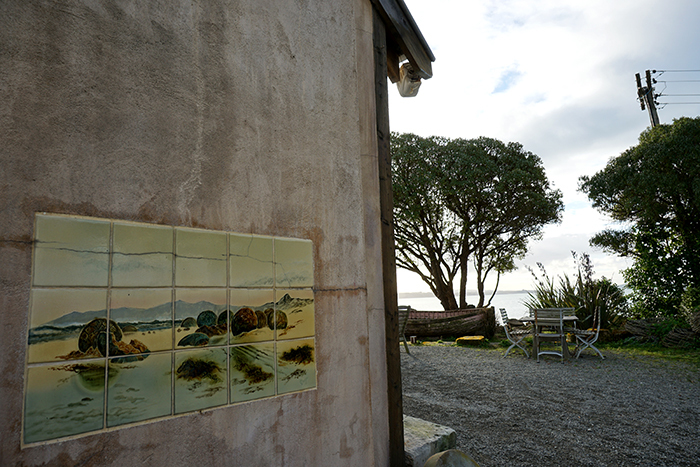 The site was an early whaling station and is built from gathered collectables and demolition materials from all over New Zealand. OK, so I referred earlier in the post to regretting taking my time heading north. 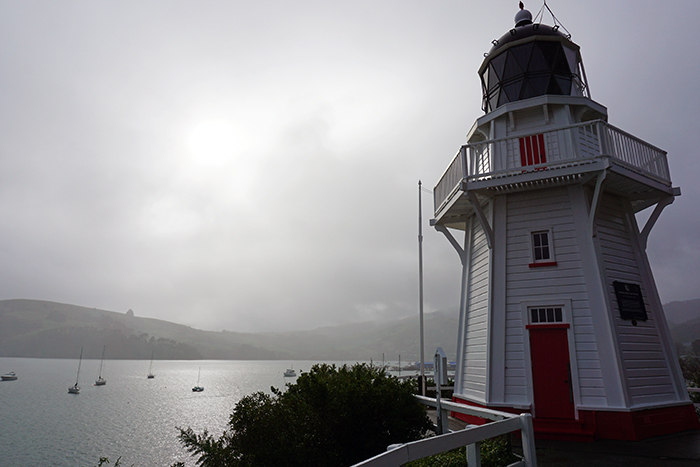 I lingered a little longer than I should have, and by the time I hit the road I was pushing hard to get to Akaroa before sundown, which I wanted to do seeing as I didn’t know the area at all. Holy moly. Worst. Drive. Ever. So I stopped to fill up with petrol at one point. It seemed a bit strange at the time, but even though the station attendant was right there chatting to a truckie, I had to use the pre-pay station. Actually, I was a little put out at the time, because I didn’t know what the go was with the whole pre-pay system (I haven’t come across it in Australia). I picked up the nozzle up and it wouldn’t work, so I was trying this and that, trying to figure out what I was doing wrong. The station attendant saw I was having trouble and called out the instructions to me- I had to first walk across the station and use the pay machine before filling it up. I thought it was a bit inconvenient at the time, couldn’t he just interrupt his chat to help me out? But it saved me big time later that night, you;ll see! 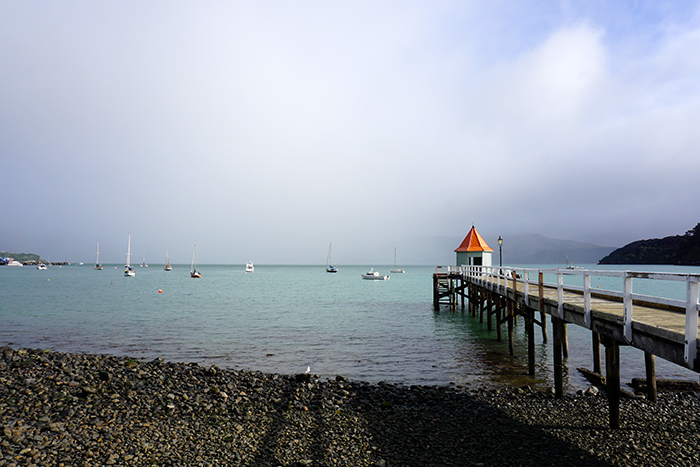 I hit the road and drove straight through to Akaroa… which got HAIRY people. HAIRY. Storm clouds rolled in. 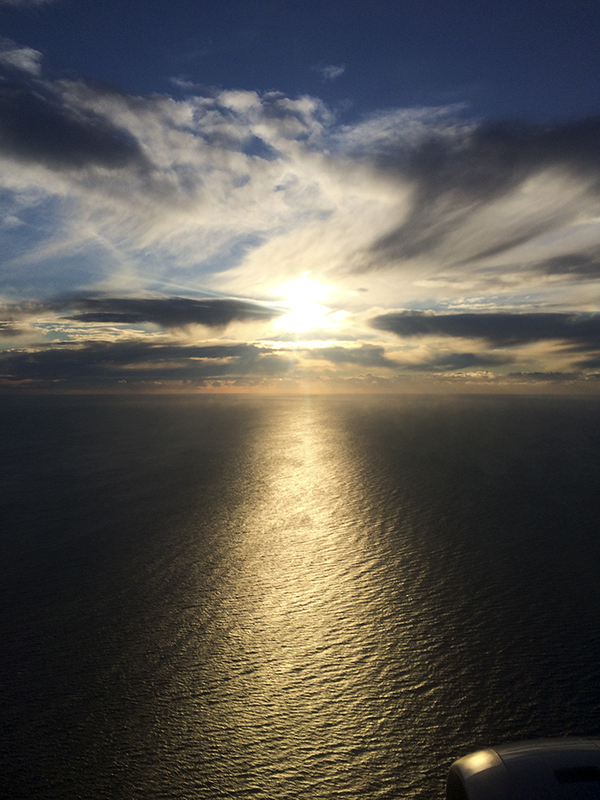 The sun set. The rain shattered down. My petrol tank emptied. AHHHHH! 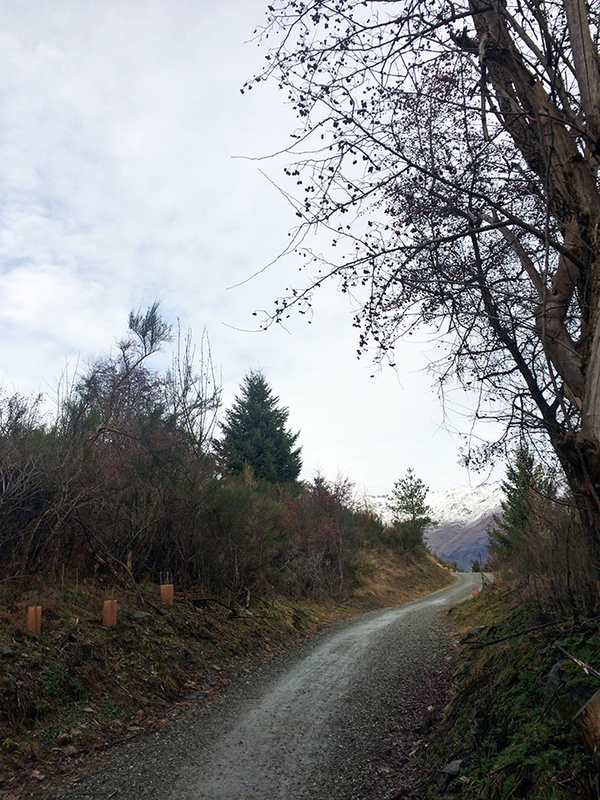 It got later and darker, the road got steeper, and then every turn became a hair pin. 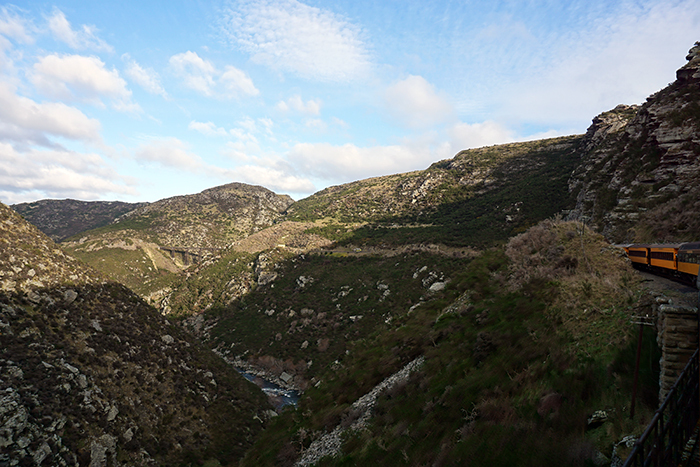 I had a vision of the car stopping, and me being stuck on the narrow road, tucked behind a hairpin and a car coming behind me and nudging me off the road into the water below. But I kept chugging forward, up the incline, corner by corner. I leaned forward in the drivers seat, hands gripping the steering wheel, peering through the rain on the windscreen, praying to see a building of some sort – preferably a petrol station. I searched on my phone, I searched on the navigation system – no luck! FINALLY I came across a pub at the top of climb. I eased into the car park and ran inside to find them closing. I explained my plight and the bartender shrugged, he didn’t seem too fussed. I stressed the urgency and he said there was a petrol station at the bottom of the hill, about 15 minutes. I figured if I coasted down I wouldn’t need to use any petrol, so I hopped back in the car and did just that. I drove into the petrol station on the whiff of nothing. AND WOULD YOU BELIEVE IT? It was a self serve petrol station. Which I would not know how to use if it had not been for the station attendant earlier in the day. Without that lesson, I would have assumed the place was closed. But I recognised the self-serve machine and was able to cruise in and fill up. 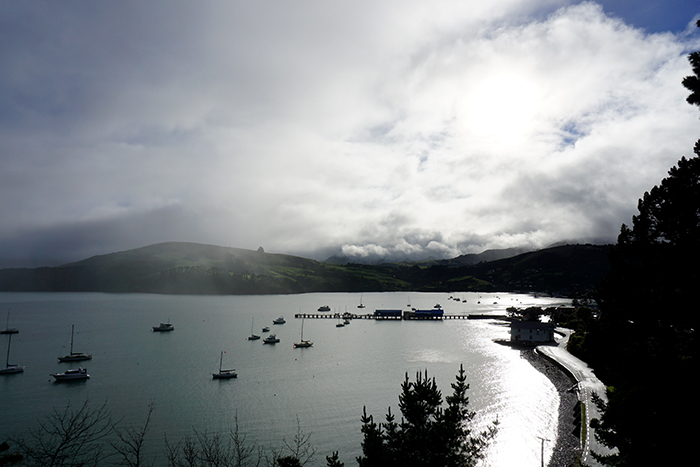 Another five minutes down the road, with a full tank of petrol, I was in Akaroa and outside the hostel I was staying at for the night. Fill up at every petrol station (almost). When driving alone at night, pack a flashlight at the very least! Be grateful for the gift of every day. And for having a brave heart to make the most of it. Have I mentioned before how much I love being in transit? 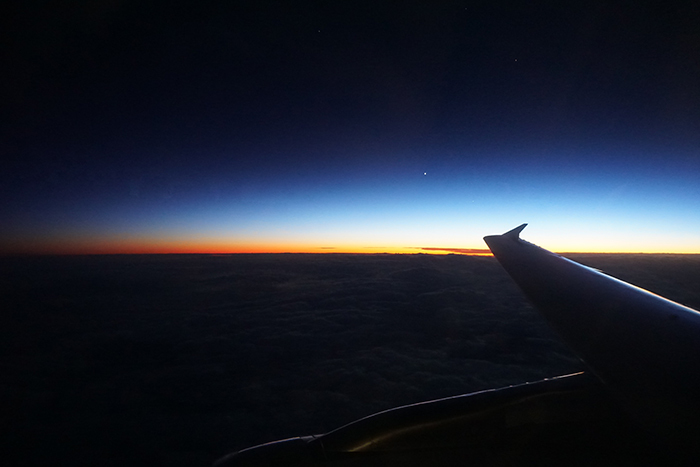 It’s always one of the best parts of travelling for me. The practice of travelling somewhere is equal in anticipation to actually arriving somewhere in my mind. Not only do I enjoy the carved out pocket of time where I can just be where I am and that is enough, but I love all modes of transport where I can look out a window and let the world pass me by. 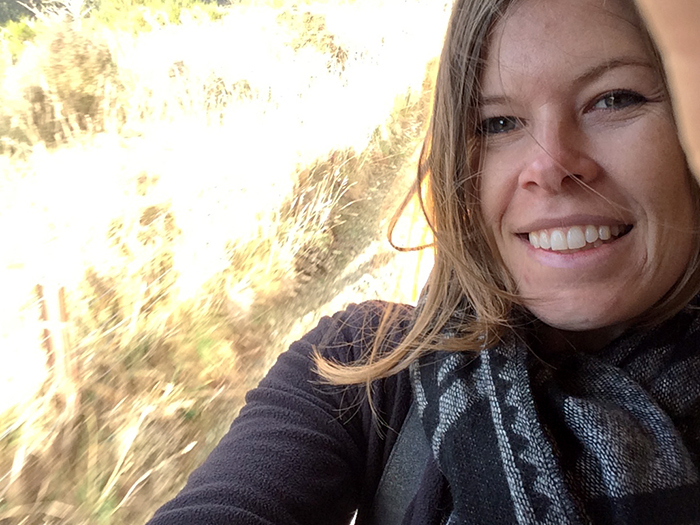 Or stand between train carriages and have my hair blown wildly around as I hang on and enjoy the biting wind on my cheeks and the fresh air filling every breath. 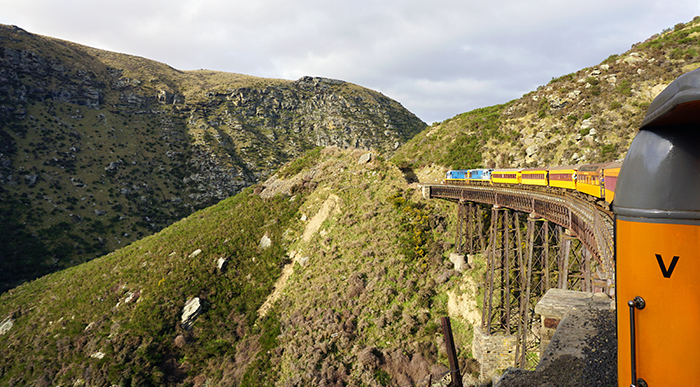 Not on a Sydney train of course – I’m talking about scenic railways such as the Taieri Gorge Railway in Dunedin! 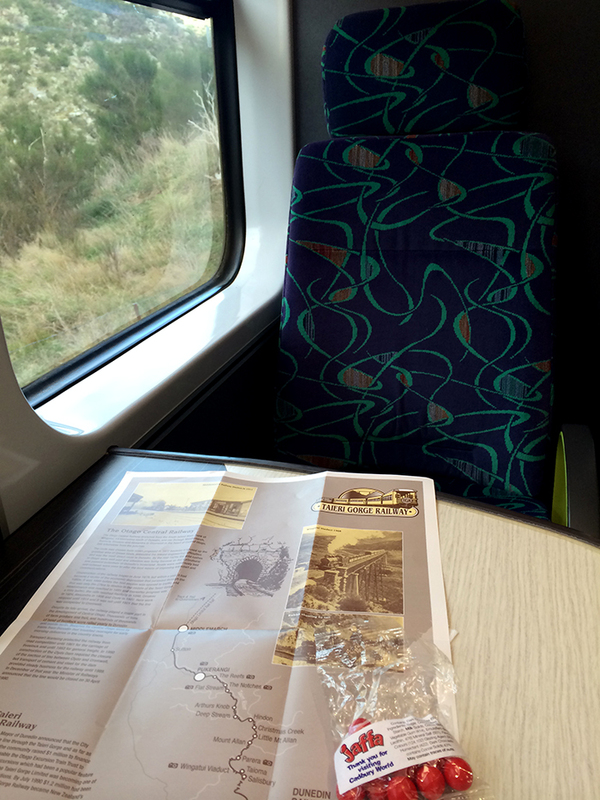 I read about the railway in a brochure I picked up in the Visitor Centre and knew straightaway I was going to get myself on that train. 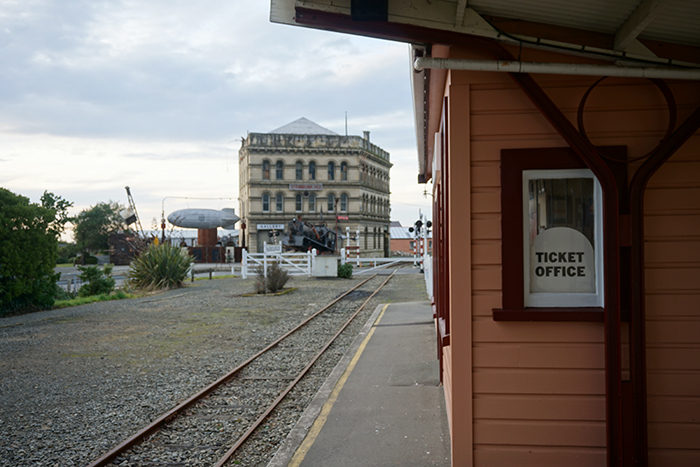 I went down to the Dunedin Railway Station – quite a nice building in its own right – and booked onto the return journey from Dunedin to Pukerangi for the next day. It was less than $100 and I had no problem booking on with such late notice. The journey covers 112km in a four hour trip which includes several stops to stretch our legs and most importantly – enjoy the view! I rocked up with time to spare in the morning, had a poke around the station and hopped on the train when the whistle was blown. I found my carriage and settled in. There is a food and drink carriage on board and I also came prepared with my chocolate stash from the Cadbury World factory tour. 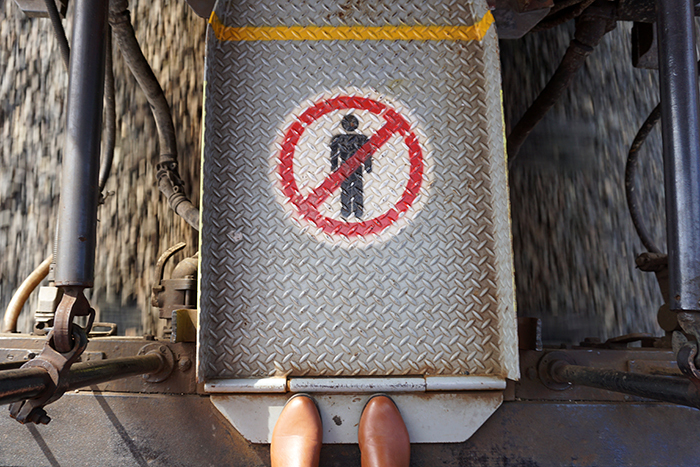 I was all set – all aboard, let’s go! 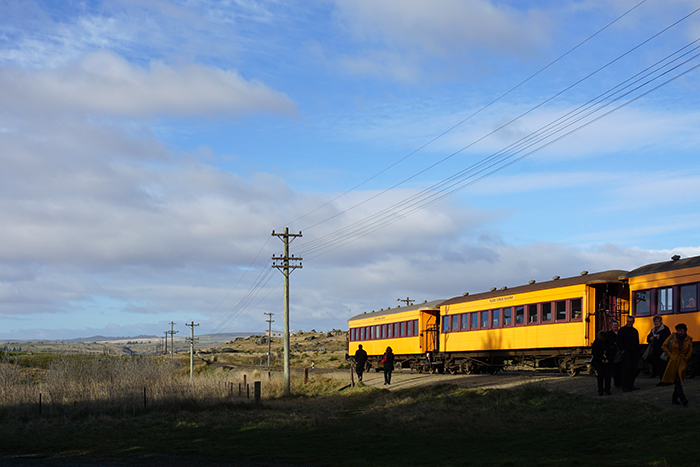 After traveling out of Dunedin the train heads south where it turns at Wingatui Junction onto the Taieri branch. 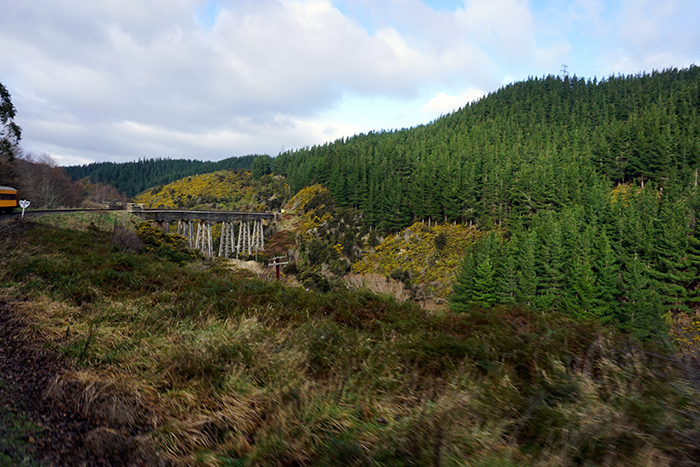 The train travels across the Taieri Plains and into the Taieri Gorge, a narrow and deep gorge carved out by the ancient Taieri River. 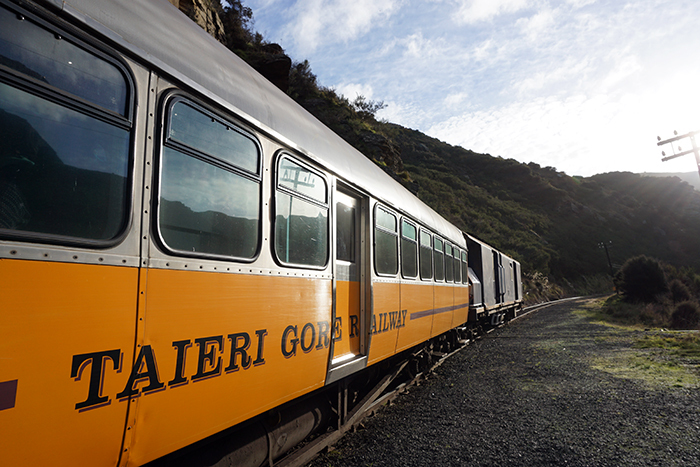 We were free to stand on the platforms between the carriages to enjoy the thrill of the ride and snap photos as the front of the train leads the way, curving around the mountain and offering snap-worthy shots every minute. 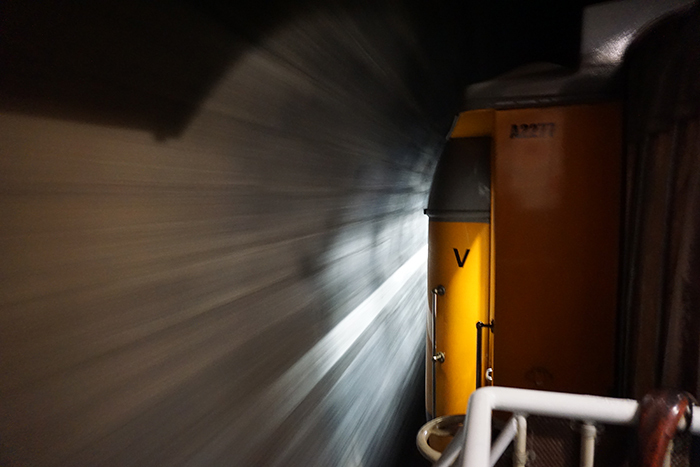 We chugged along through ten tunnels and bridges galore – picturesque at every turn. 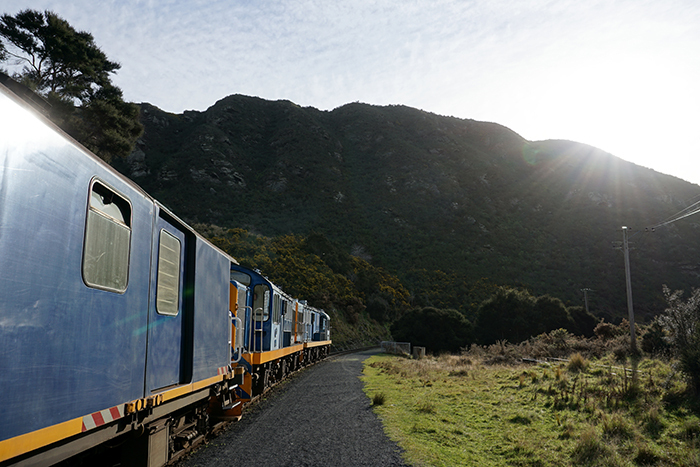 Towards Pukerangi one of the train drivers tapped me on the shoulder and jerked his head to the back of the train. 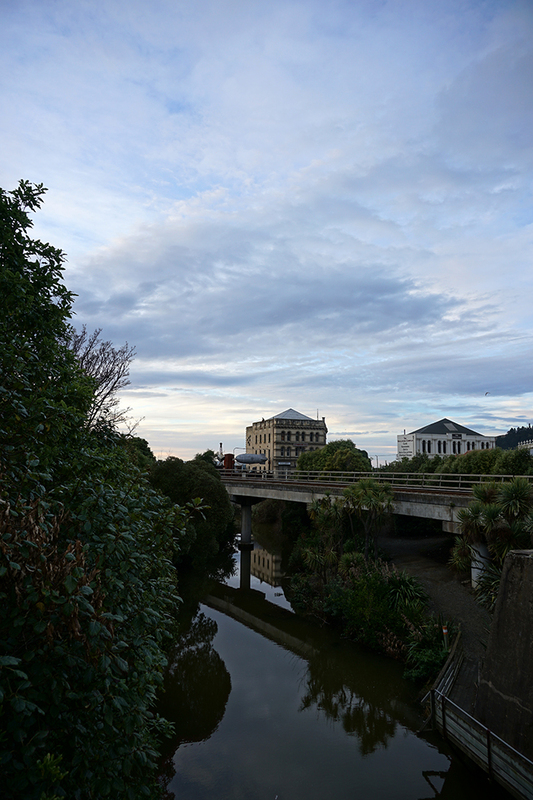 “Go stand on the back platform in five minutes, you’ll get the most breathtaking view as the train heads over the bridge. I didn’t need to be told twice! Down I headed and I spent twenty minutes out the back snapping pics and leaning into the wind. My eyes were streaming and my hair was a-crazy, but I had a big smile on my face. It was amazing! 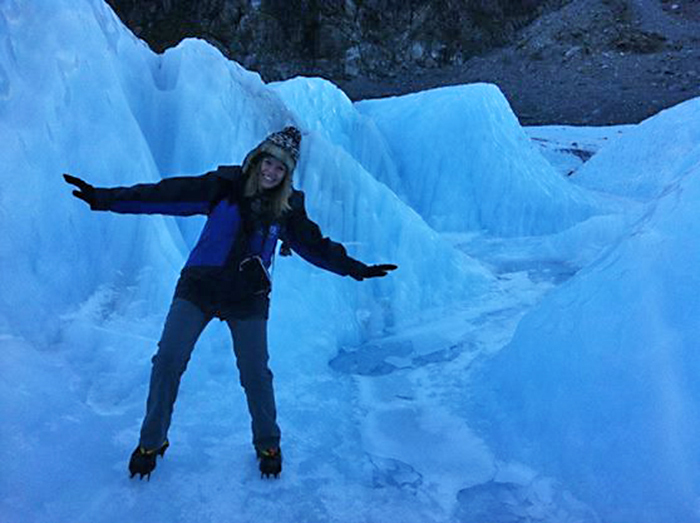 The tunnels were also fun – though I held on tight to my camera and kept all limbs rigid as a board by my side!!! 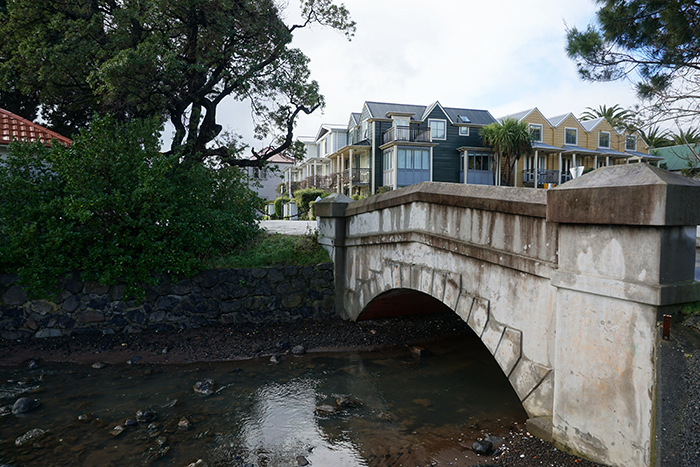 While in Dunedin I stayed in a one bedroom apartment at Roslyn Apartments. The apartment was beautifully furnished and offered a nice, quiet, cosy retreat from the hustle and bustle of being on the road for almost a month. It was a bit out of the city centre, but just across the road and up a little is a supermarket and a row of cafes and stores for any immediate needs/coffee, and being up on the hill offers a great view. It only took me about 20 minutes to walk down hill from the apartment (maybe 25 minutes on the way back home). Surely it would be an inexpensive taxi ride, though I always walked because it was an enjoyable, pretty journey. Although I often avoid them, sometimes the best way to explore a new city is on a sightseeing bus – you get to cover a lot of ground while someone tells you everything you need to know – plus a lot of interesting trivia. 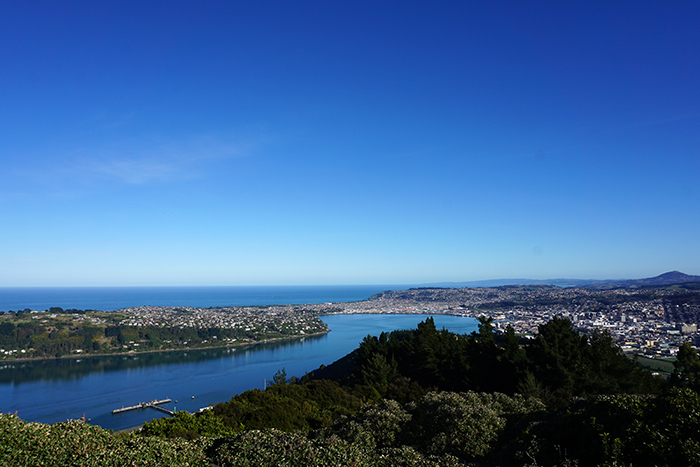 I was in the iSITE Visitor Centre when I overheard a guy thanking one of the staff for recommending the Good Company Dunedin Tour he had gone on the day before on their recommendation – I intercepted him as he was walking out the door and asked him what else he’d enjoyed doing in Dunedin. 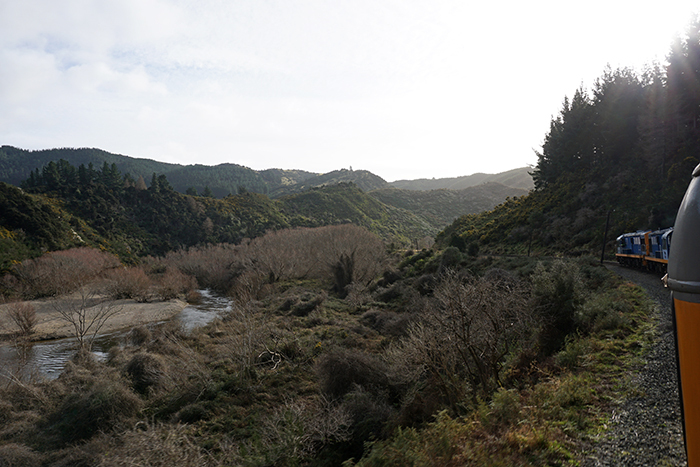 Cue a 30 minute conversation chatting with a fellow traveller; he gave me heaps of tips for the South Island, and I gave him tips about the North Island where he was heading next. I went back into the centre and booked on the afternoon tour, which gave me a couple of hours visiting some of the local stores before hoofing it back to the centre for the bus pick-up. 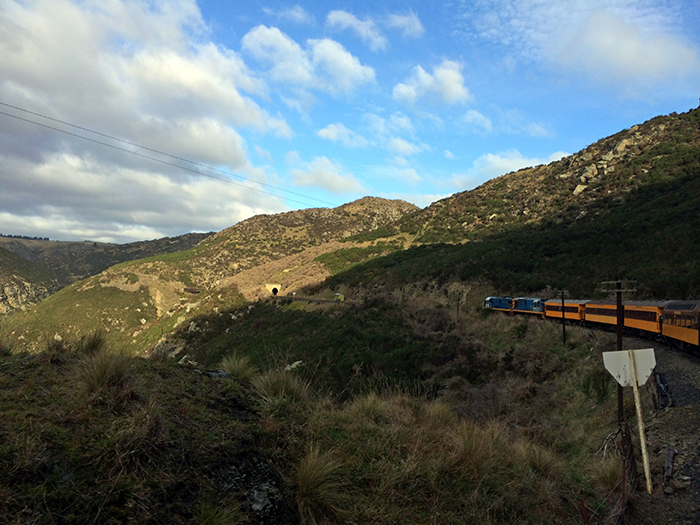 We went in a mini-bus, myself and three older couples, Aussie and English. 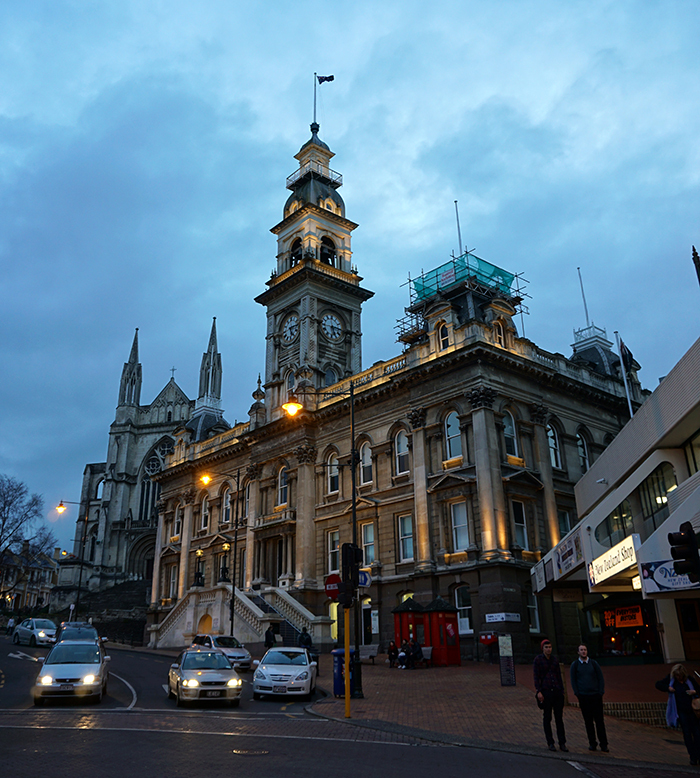 Our friendly driver/tour guide launched straight into telling us all about Dunedin – which turns out started out as a southern hemisphere Edinburgh, designed by two Scottish Presbyterians who wanted to create a Presbyterian town free of the politics that plagued their homeland. 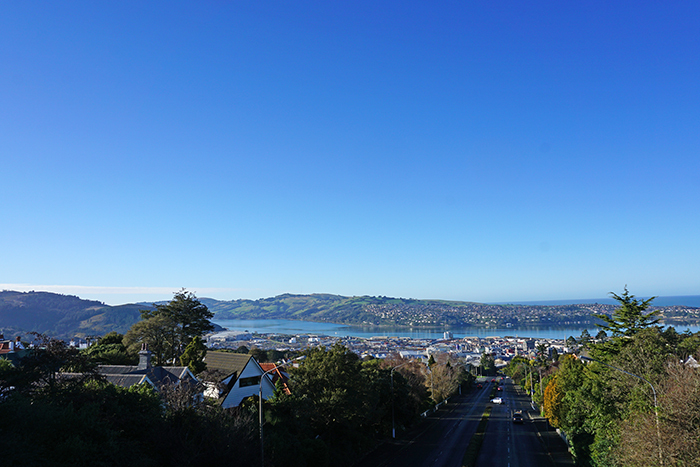 Dunedin means Edinburgh in Scottish Gaelic; they intended to build the town with Edinburgh’s street layout but had to change it when they arrived and realised that mountainous New Zealand equals a hilly Dunedin, not quite as flat as Edinburgh. 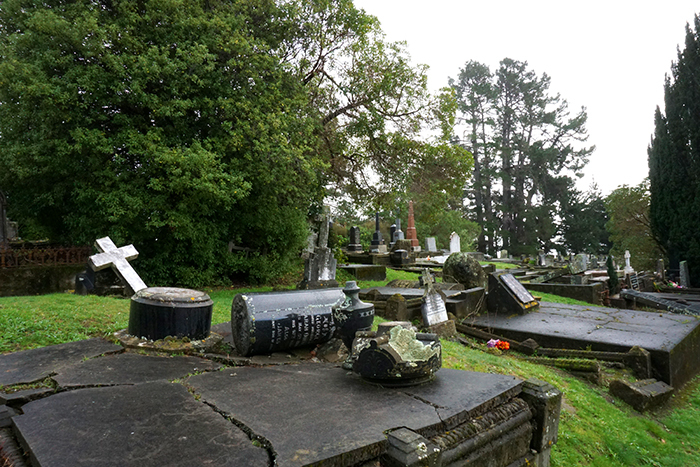 One of the more interesting things I learnt was that the Knox Church was built at the top of the hill, and the Speight’s Brewery was built at the bottom – much to the annoyance of the Presbyterians whose blessed water ended up at the bottom to be used by the brewery! 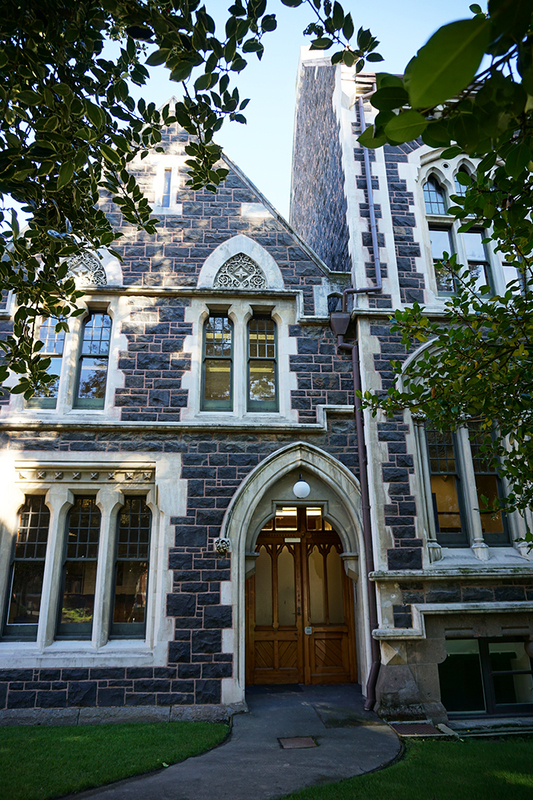 Also very interesting is that the Otago girls school opened before the boys school in 1870! Quite progressive for its time. 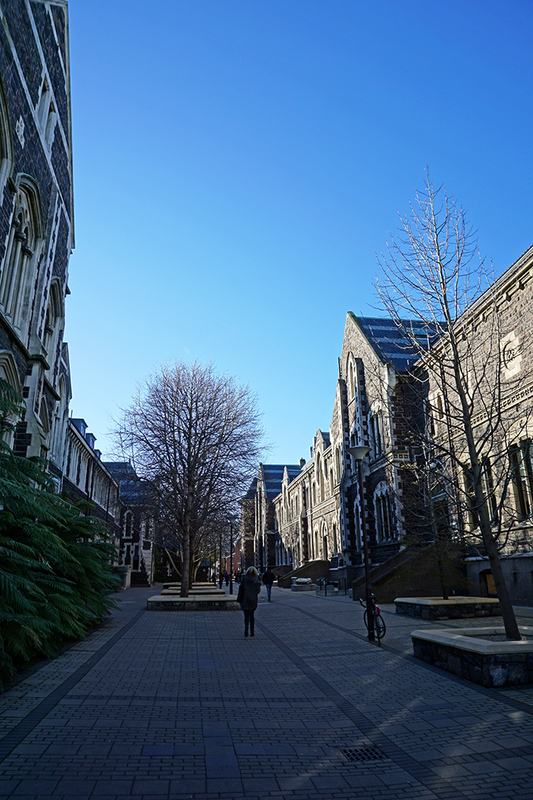 We stopped for a ten minute walk through the University of Otago which was very pretty; definitely feeling the Scottish influences here – almost a little Hogwarts-esque may I dare say. 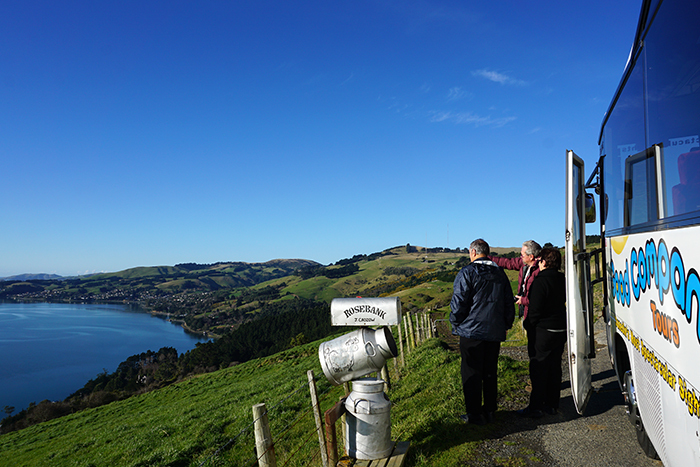 At the top of Signal Hill Lookout the views encompass the Otago Harbour and Otago Peninsula – so beautiful on a clear Winter’s day. 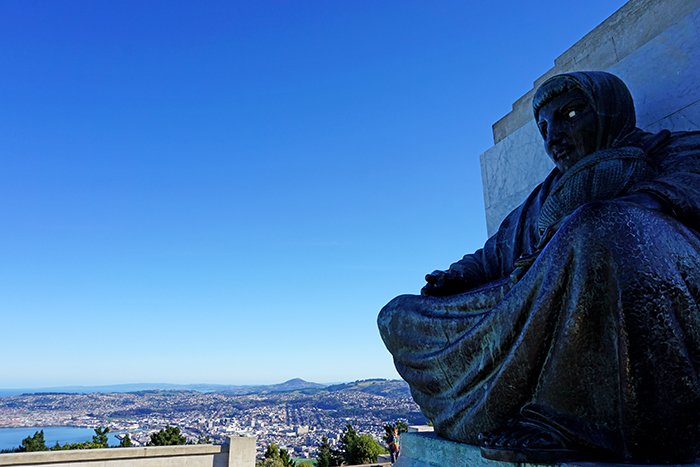 There are two large statues at the top, sitting almost Buddha-like, watching over the city. Our tour guide shared a local conspiracy that the statues were ordered to be made in London by the City, but in a cost-cutting measure, they took in two statues that were originally made for a temple in India – hence the robe-like clothing and prayer-like crossed legged poses! 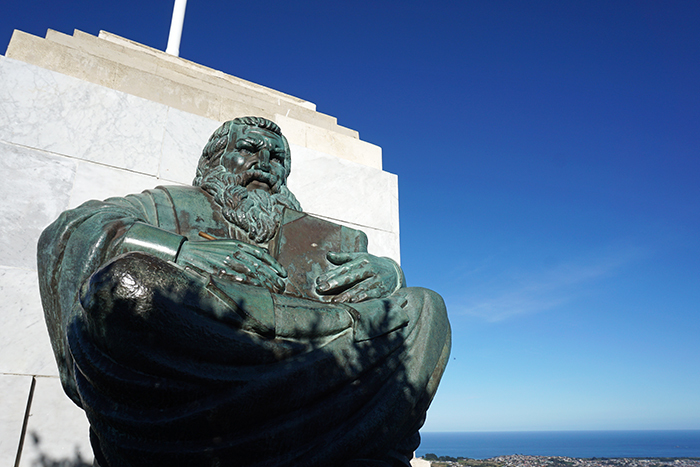 I have no idea how much merit that theory has, but regardless, the male figure represents History and faces West, holding a book with the years 1848-1948 engraved on it. The female figue represents Future and gazes East, holding ‘the thread of life’ on her lap. Along the harbour there are a row of teeth. Strange, yes. Officially know as the ‘Harbour Mouth Molars’ – the sculpures are six wisdom teeth. 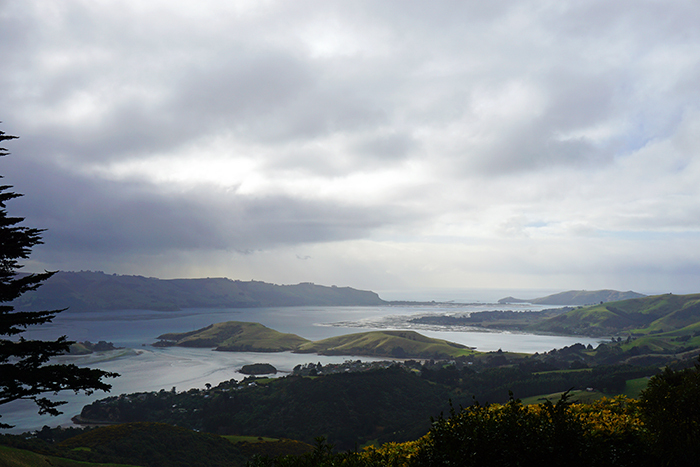 We drove to the Otago Peninsula and stopped to enjoy the rolling green hills and brilliant blue water views. 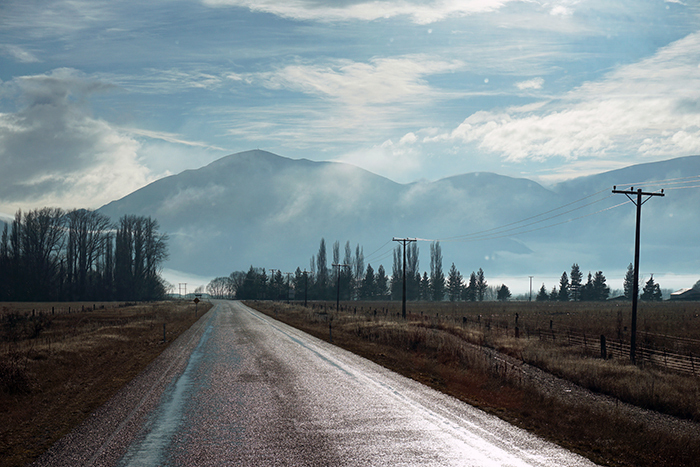 Iconic New Zealand! 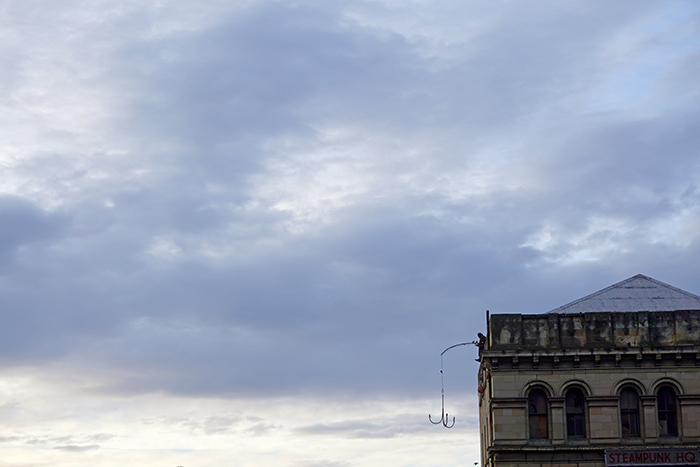 After getting back downtown as the sun was setting, I walked home past St Pauls Cathedral. On the advice of the traveller I met at the Visitor Centre I went to the Olveston Stately Home the next morning and did the house tour there. I’m a nerd and love period homes – probably because I also love period novels and film, so getting to visit a period home furnished is fun (because I can swan around pretending I’m Lizzie Bennet or Miss Fischer). 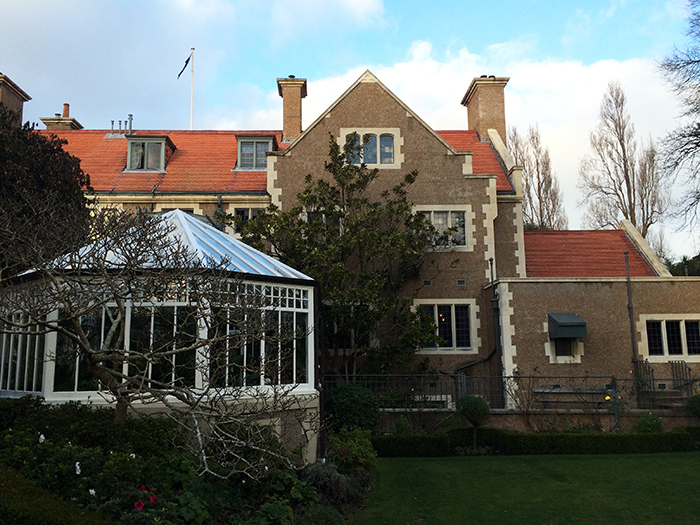 I couldn’t take photos inside, but it was an excellent tour – the house is indulgently decorated with many ‘mod-cons’ of the early 20th century as well as furnishings and artwork from across the globe. The tour guide and caretakers know alot about the Olveston family and history so the tour is full of interesting facts and information. 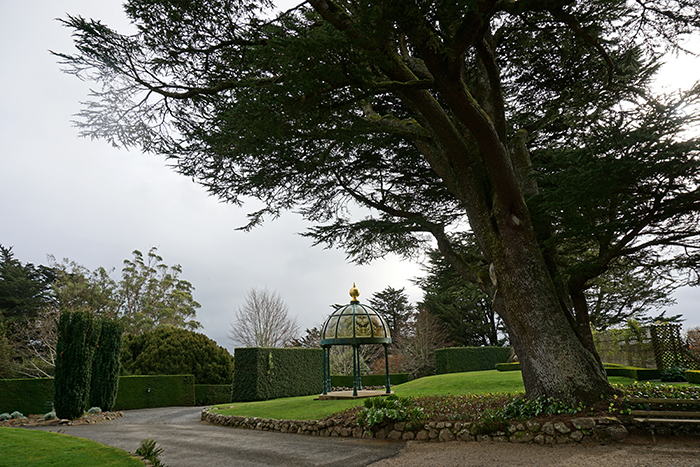 Olveston was built for a Dunedin businessman, collector and philanthropist David Theomin, his wife Marie and their two children Edward and Dorothy, who travelled extensively prior to building the home in 1906. Unfortunately no further generations lived in the home as Dorothy was the last family member who died without heirs. 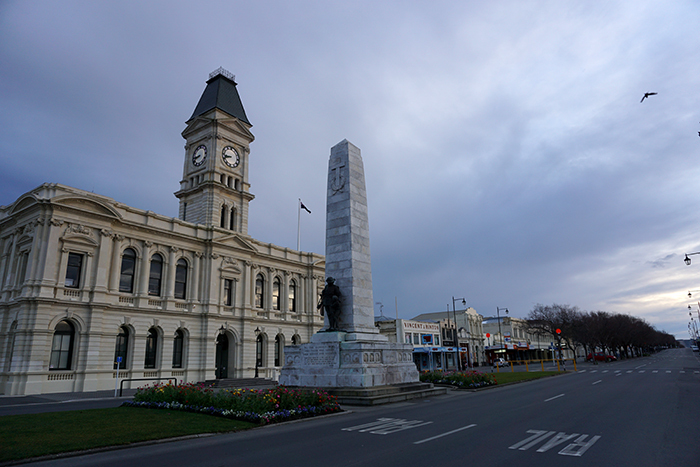 She left the house to the City of Dunedin who at the time thought it was a bit of a drag and seen as only an expensive drain on tax payers money – until they looked inside and realised what valuable collections were there. 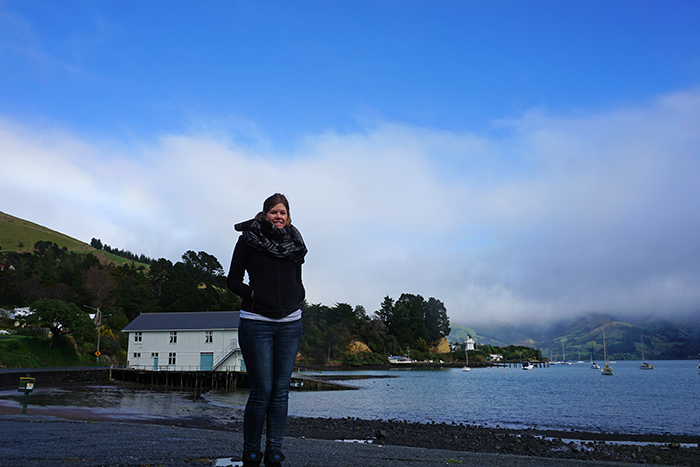 So it turns out I rocked into Dunedin the week of the Cadbury Chocolate Festival… Yes, poor me. The trials of the wanderer are fierce. It was honestly quite the coincidence – you would think an extreme chocoholic like myself might have had a bit more of an intentional hand in such synchronicity, but no. As unplanned as it was there was clearly the hand of the universe at play, which has a way of revealing our destiny to us at the appropriate moment. Unfortunately I was leaving the day of the famous Jaffa race which was the event I would have been the most interested in. 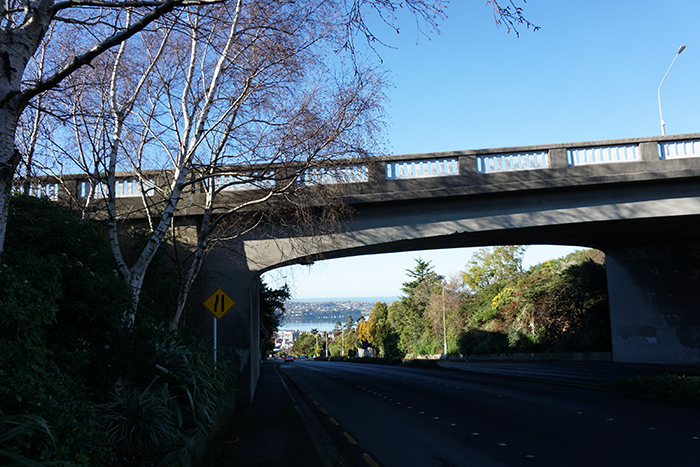 I had heard of this many years before from a Kiwi housemate – the steepest street in the world is in Dunedin (Baldwin St) and the city makes good use of it by unleashing thousands of jaffas down its slope one day every year. The jaffas are all branded with a number, each one funded by members of the public. The first ones to reach the bottom of the hill win their owner a prize. Very cool! But unfortunately I missed it. 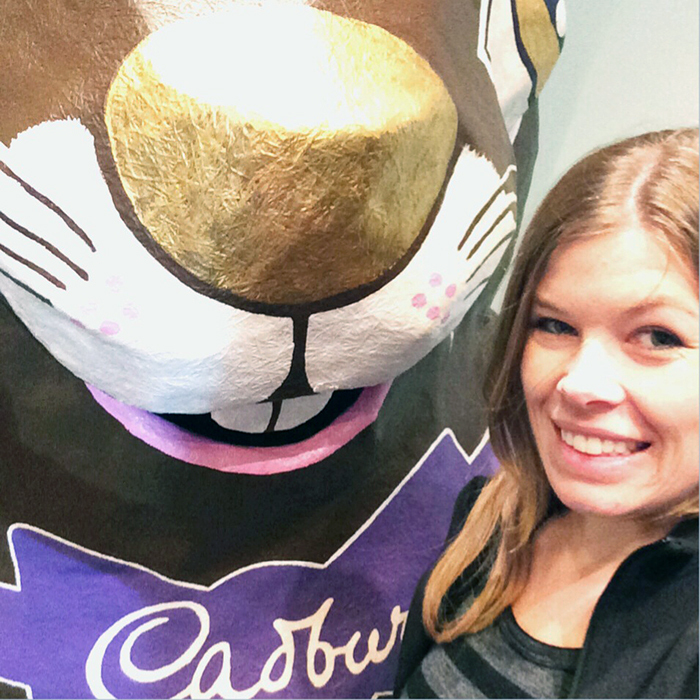 I did go to the Cadbury World factory though and signed up to go on the tour. It was brilliant. 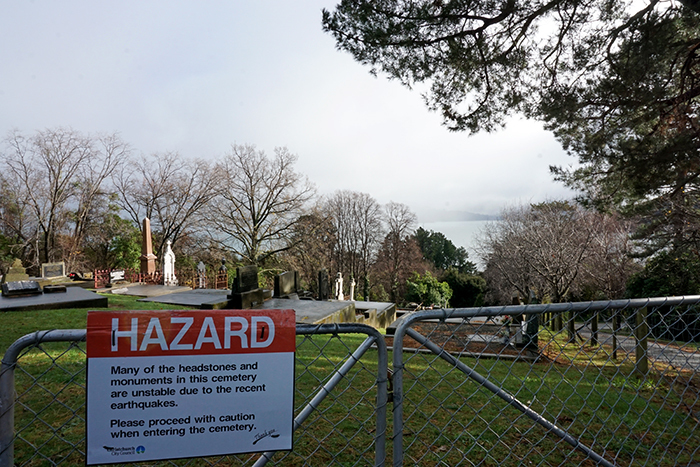 Sometimes these kind of things don’t really live up to expectations, but the tour was really interesting, we got given heaps of Cadbury products in our goody bags, and our lovely tour guide was genuinely enthusiastic about everything she had to show us. The tour cost $22 and is best booked at least a day before if you’re on any particular schedule. The full tour takes 75 minutes and runs every half an hour during the day so you’ll likely get booked on one with short notice. When I turned up for my time slot I was invited to wander around looking at some momentos from Cadbury’s history until it was time to start. Within five minutes I was approached by an Ompaloompa. I know, that’s a different chocolate factory, but I was flummoxed when a short person came up to me in purple overalls, white long sleeved arms and a white puffy hairnet. 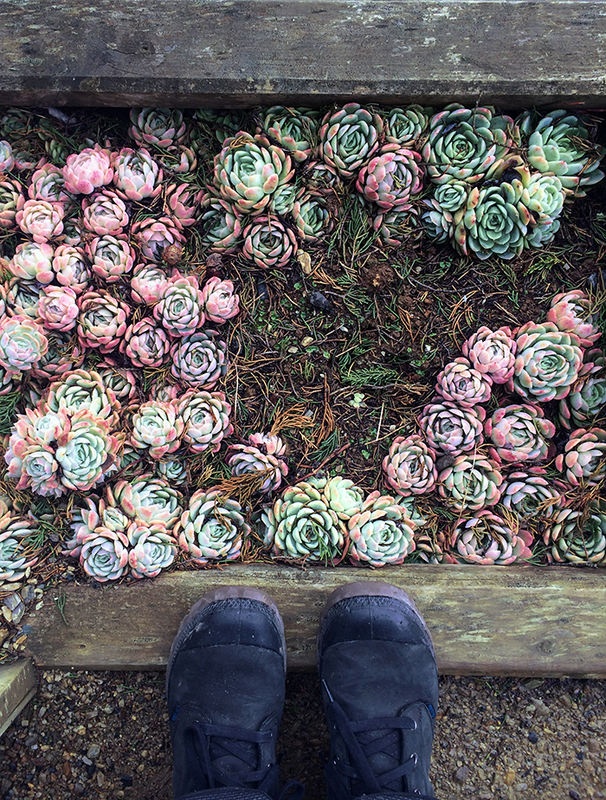 I looked around and there was quite a few of them – virtually indistinguishable from each other! My Oompaloompa asked what time slot I was in and asked me to meet by the door, where she would lead the tour from. Our small group of 6 assembled and we started. First of all we watched a short video about the history of the Cadbury family, then we all donned hairnets, and for the guys with facial hair, beard snoods (!!!) All jewellery had to be removed or taped down onto the skin. 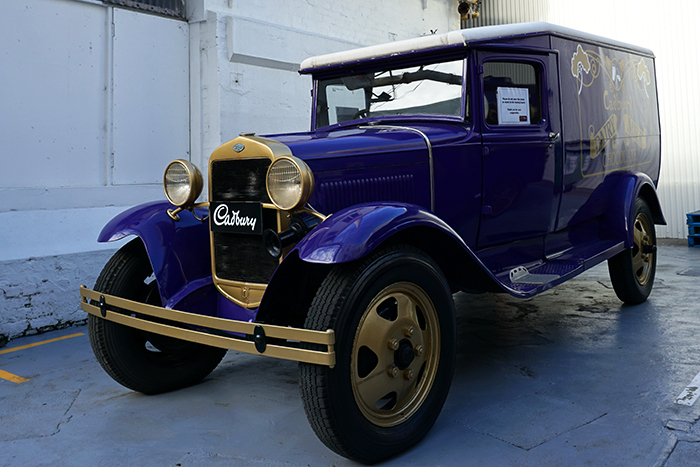 Our guide explained that the Dunedin Cadbury factory is the last working chocolate factory in the world that you actually tour through and see things in action. It means that we have to take precautions to ensure the factory remains hygienic and up to food safety standards. The walkways we stuck to as we wandered through the place was separated from the actual chocolate production, but it was still reassuring to see the extent they go to to keep the products protected. Cameras are not allowed on the tour so I have no pictures to share, however I’ll paint you a picture of my highlights. My absolute favourite part was the coloured pipes on the ceiling. There were four colours, and they ran unpredictably, sometimes all four together, then randomly splitting off and criss-crossing across each other. Each colour pumps a different kind of chocolate to each of the machines. Dark chocolate, milk chocolate, white chocolate, and couverture chocolate. Depending on the Cadbury product that is made at each station depends which coloured pipes run to there. The only Cadbury product made with all four types are Choc Bits, which turn up in the baking aisle of the supermarket. I was mesmerised by the Choc Bits being piped down onto the conveyor belt in a grid of about a hundred bits or so. There must have been a blockage on one of the nozzles as watching the grid of bits trundle past on the conveyor belt there was a single ‘Bit’ missing in every grid. A little blank space in the neat orderly rows of Choc Bits. The grand finale of the tour was walking into one of the tall towers that are so dominant from the street. Here, a tonne of melted chocolate is dropped from the centre of the tower and thunders past us. 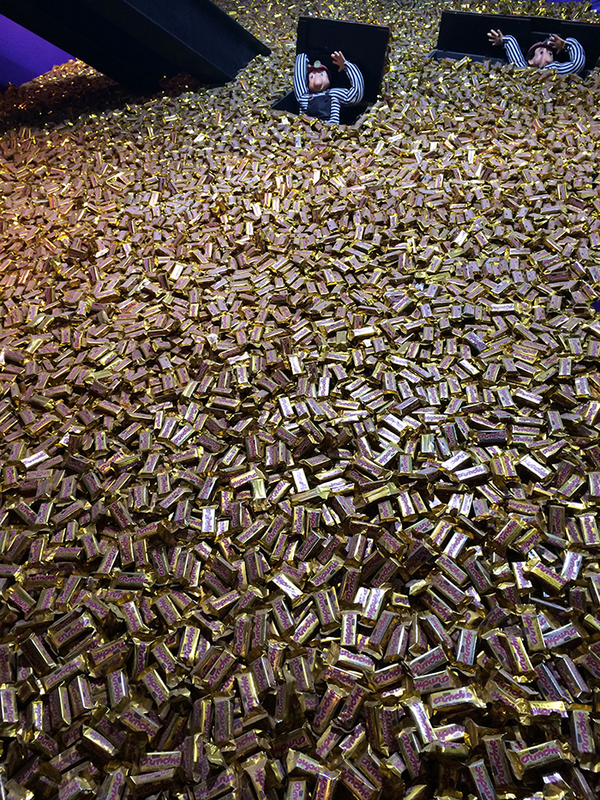 The same chocolate is used for a whole year – it is collected at the bottom, kept warm and pumped back up to the top again for the next group. So obviously, this is not chocolate you would want to put in your mouth! Luckily they had a special batch for us to try which came from a machine that squirted tablespoons worth down into a tray of about 12 mini-cups. I really loved seeing the machinery aspect of the factory, so efficient! 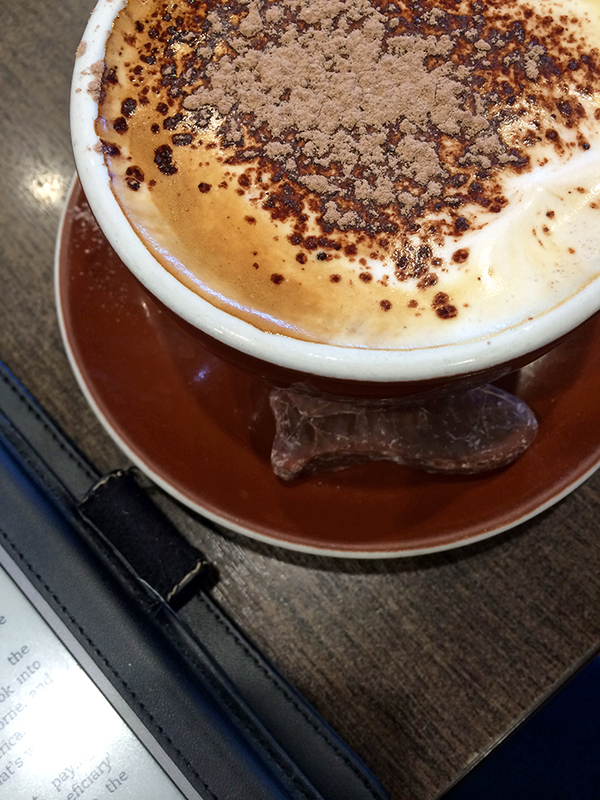 There is a cafe on site, where the mochas are delicious and served with a chocolate fish! 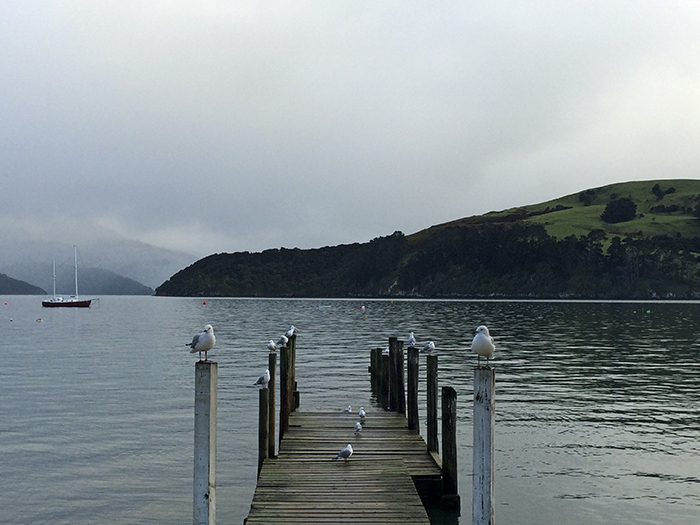 Dunedin is not just about chocolate – it’s a pretty cool town actually! More on my four day visit in the next post. Yes here I am, still continuing on with my New Zealand travel posts. From last year. From August. Oh well! 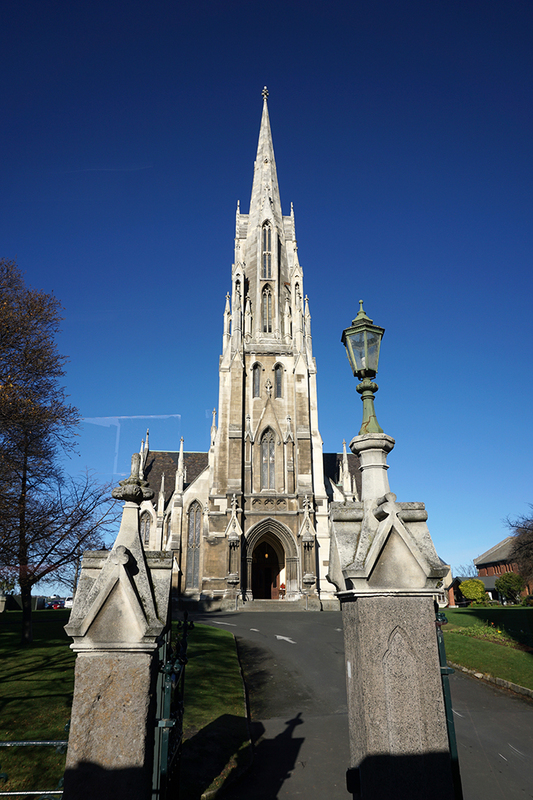 So there I was in Christchurch, with a week left before my flight to Sydney. 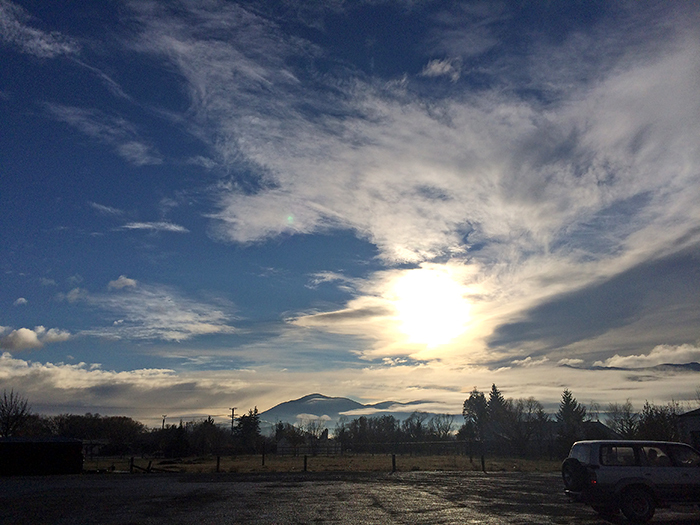 It’d been on my heart list for awhile to embark on a solo road trip. I’ve done this a couple of times in the past (my favourite to Byron Bay in 2007) and a couple of duo road trips (my faves were a week around the Irish coastline with my friend Anna when I was 21, and an almost-week meander around Tasmania with my friend Anette when I was 28). 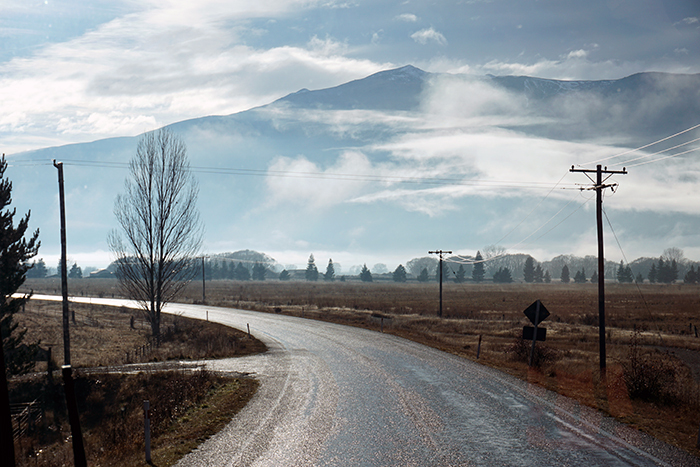 After a while I start to feel a yearning to hit the road again. 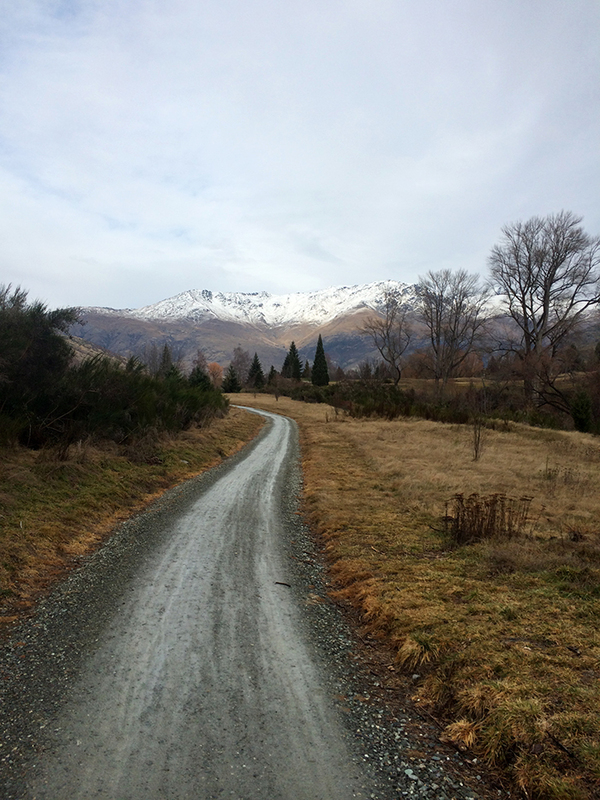 For my last week in New Zealand I knew I wanted to hire a car and road trip. 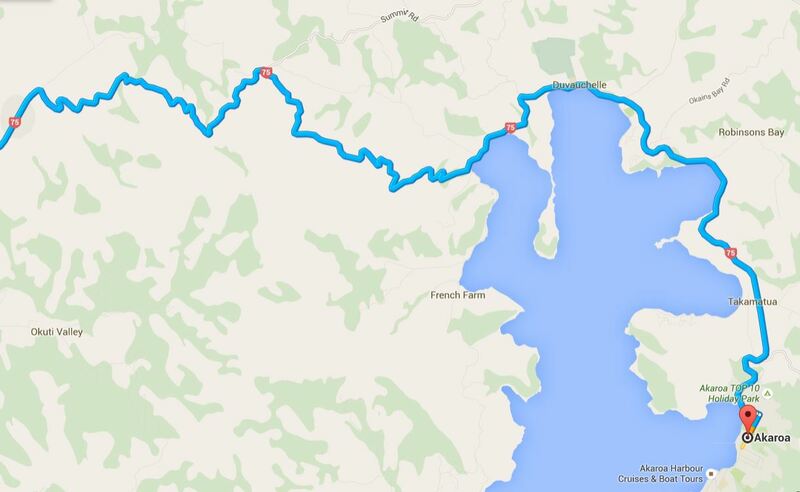 I studied the map and decided to take a mosey down the south east coast of the South Island. I booked a budget (but not bomb) option on a website called Economy Car Rental. I had a bit of trouble finding the pick-up location because the receipt named one local business pick-up but it actually operates out of another one – it wasn’t really made that clear on their website or booking process but other than that the hire experience was really positive. The guy at the local Scotties Rent a Car pick-up location was very helpful, setting up the navigation console and giving me multiple contact numbers in case I ran into any trouble. 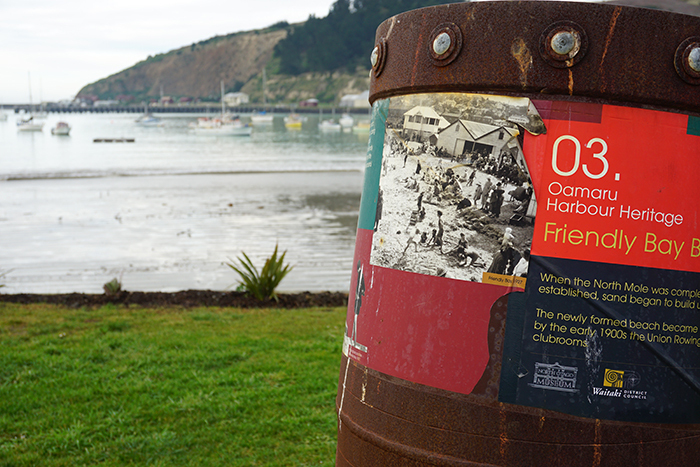 I set my sights on driving south to stay the night in Oamaru. 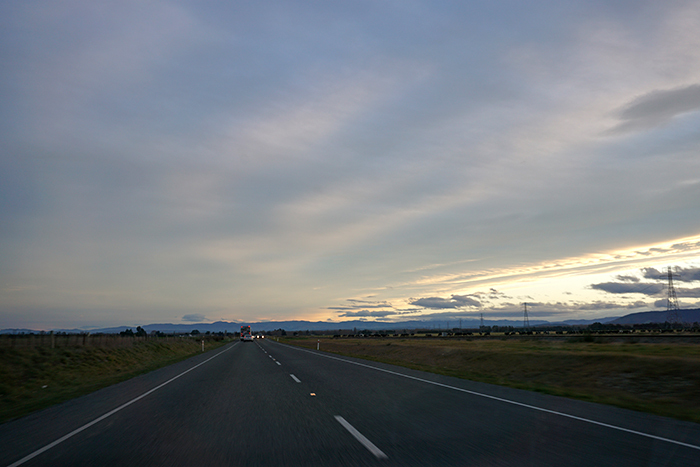 It took about three hours, and I ended up driving pretty much straight through as I left at 3pm and it fell dark before 6pm. It suited me to get into the swing of a long stretch in the driver seat listening to Jack Johnson on shuffle and sinking into the blissful nowhere-to-be, no-one-to-see state of mind after three weeks of jam-packed activity. 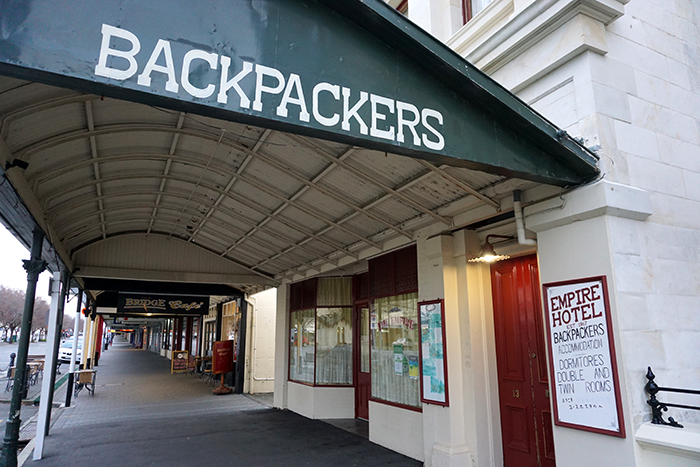 I stayed at the Empire Backpackers which I found online and booked that morning. 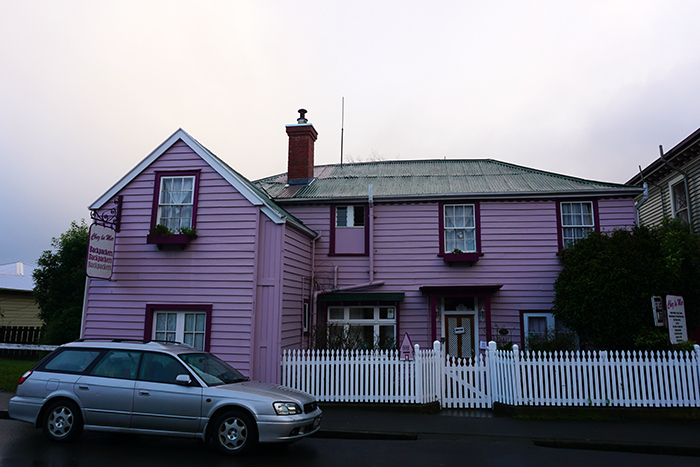 I had a lovely stay there, appreciating the homely vibe and the main street location. I was welcomed by the hosts, given a tour around the common areas and accompanied up to my room whilst generously being offered suggestions for my short visit. I stayed in a private room which was just perfect – a big comfy bed, heater, lamps – simple but clean and very ‘guest room’ like, it felt like staying with friends. I highly recommend a stay there if you end up in that part of the world. I walked the main street looking for somewhere to have a hearty meal; the neighbourhood was quiet and cold, but really beautiful – I knew it would look completely different in the daylight. 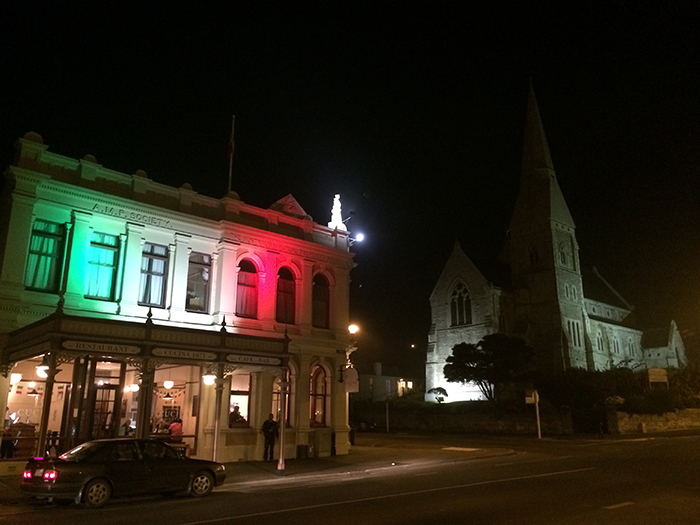 I had a delicious bowl of soup at the Star and Garter Restaurant and then had an early night – there was not too much happening in Oamaru on a Saturday night! 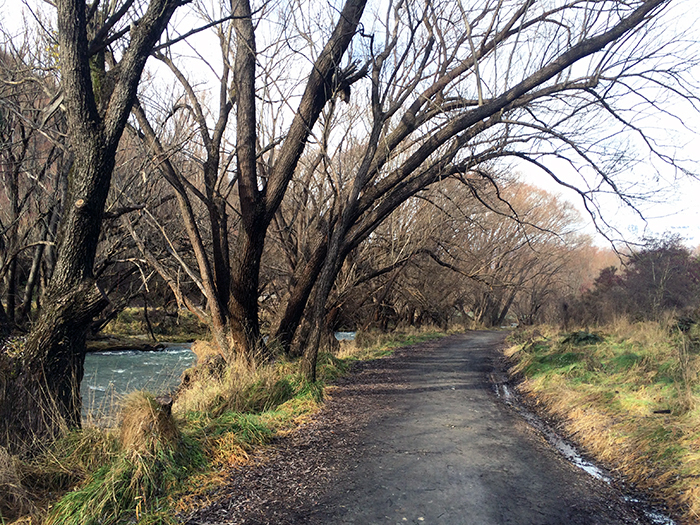 But I kept on walking as the crisp morning beckoned and I wanted to explore a bit more. 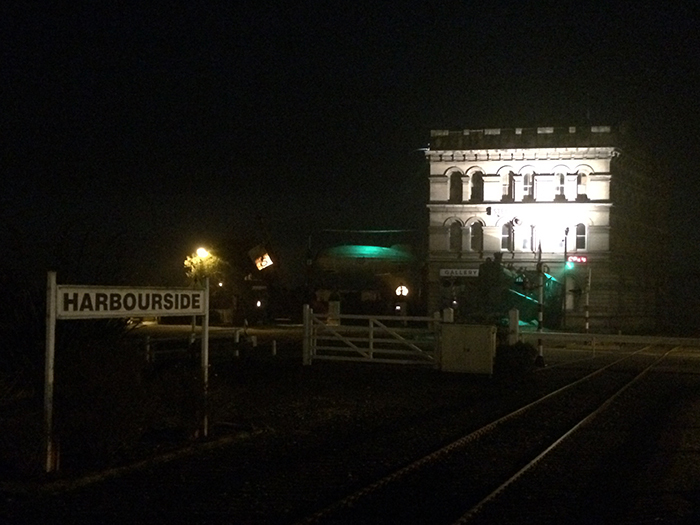 The Victorian Precinct is quaint! 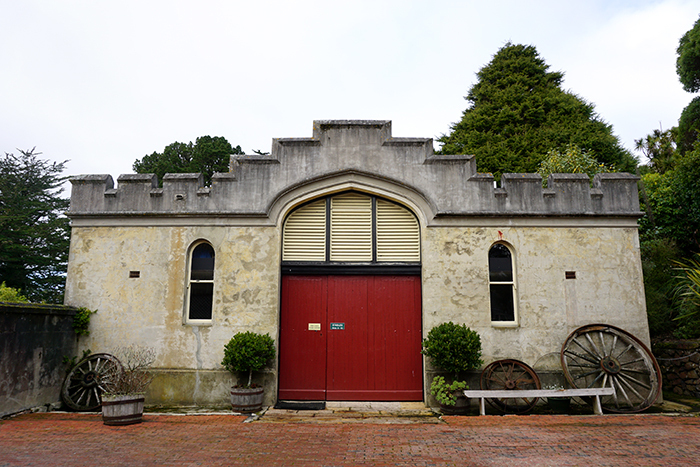 Such beautiful architecture; the European kind; the we’ve-been-around-for-ages historical kind; the kind we don’t see too often in the relatively young Down Under territory. Steampunk is a quirky and fun genre of science fiction that features steam-powered technology. It is often set in an alternate, futuristic version of 19th century Victorian England. The Steampunk future is driven by unusual steam powered devices – the ‘world gone mad’ as Victorian people may have imagined it. Examples are machines like those in the writing of H. G. Wells and Jules Verne, and in tv shows such as Dr. Who. 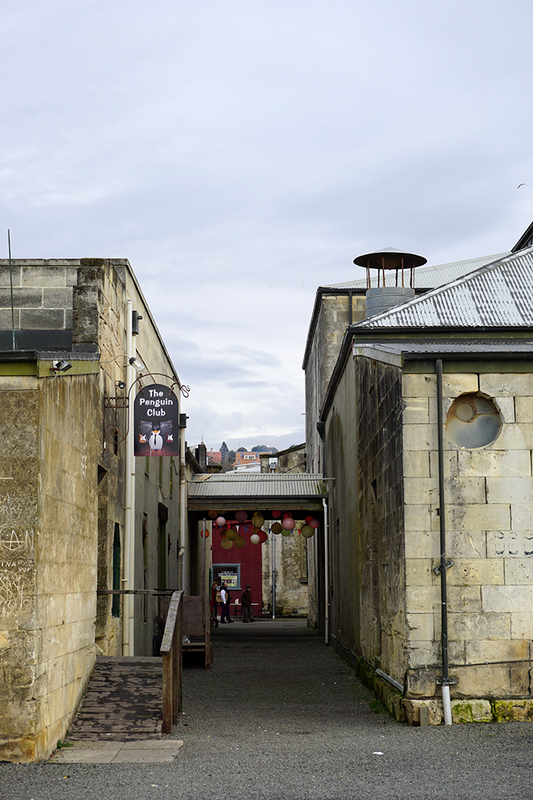 Oamaru is an ideal setting for Steampunk art and activities, given the wonderfully preserved and thriving Victorian buildings. It was closed up when I walked by so early, I would have liked to go into the museum but settled for watching the interactive train/art piece out the front. 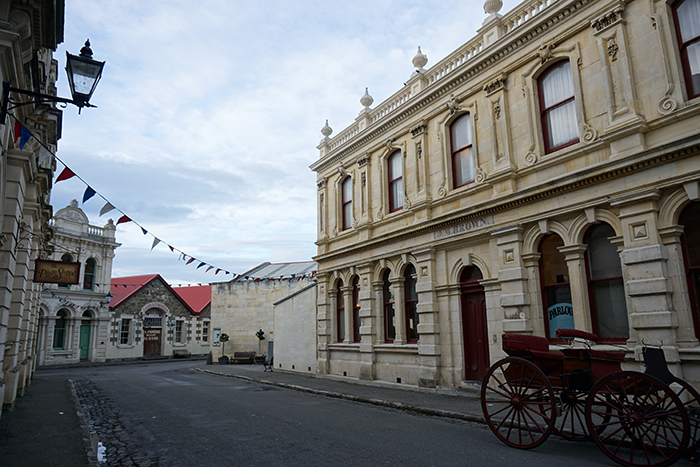 The Victorian Precinct feels like a step onto a movie set, the 19th century buildings are mostly made from the local limestone. 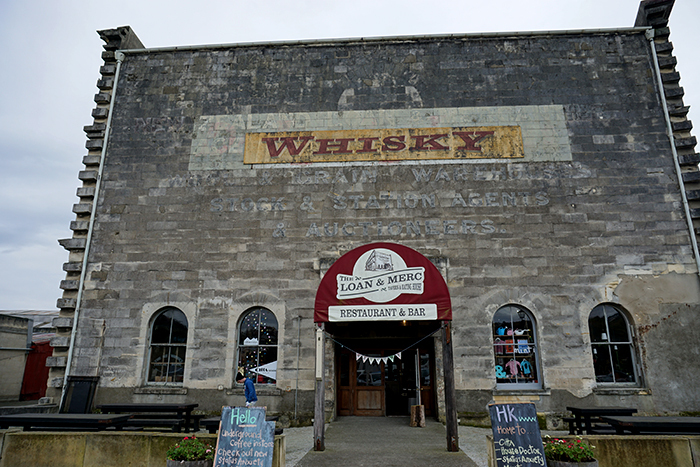 The community has cultivated the olden day atmosphere of the buildings into the local businesses. Cafes, book stores, art galleries, gift stores. A stroll through feels quite magical. I stopped in for breakfast at the Woolstore Cafe, in the old Woolstore Complex, a grandly restored storehouse built in 1881, 100 years before I was born. I sat by the window and watched the early morning foot traffic made up mostly of people setting up for the weekend market. 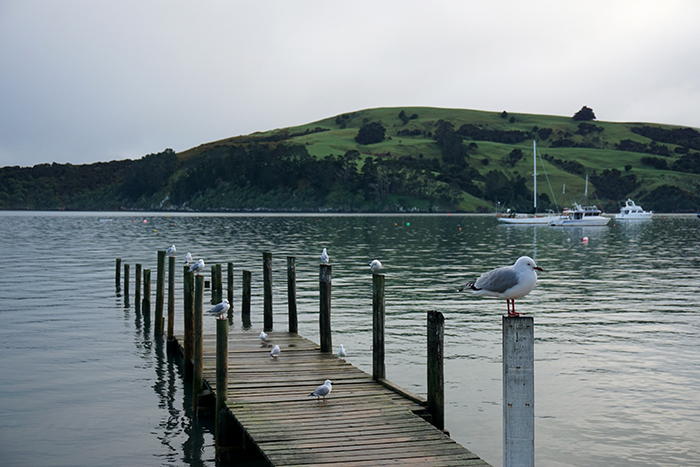 The precinct is located right on a small harbour so I walked around the back of the buildings towards the water. It was eerily quiet, just me strolling around, the wind cool on my cheeks and my breath puffing out in little clouds in front of me. 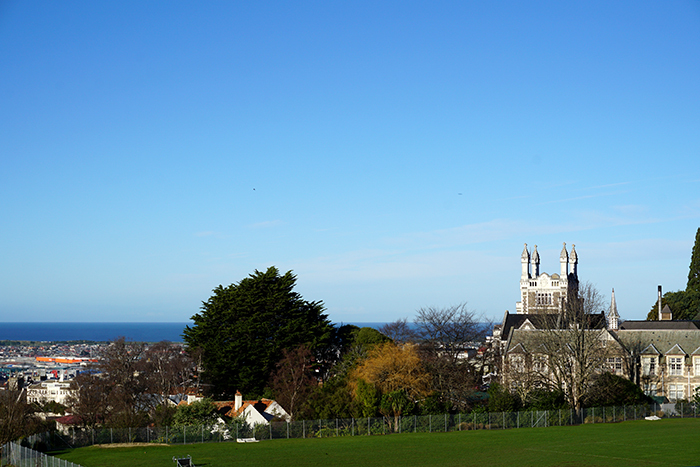 The texture of the buildings on this side was even more gorgeous, weathered away by the seafront. 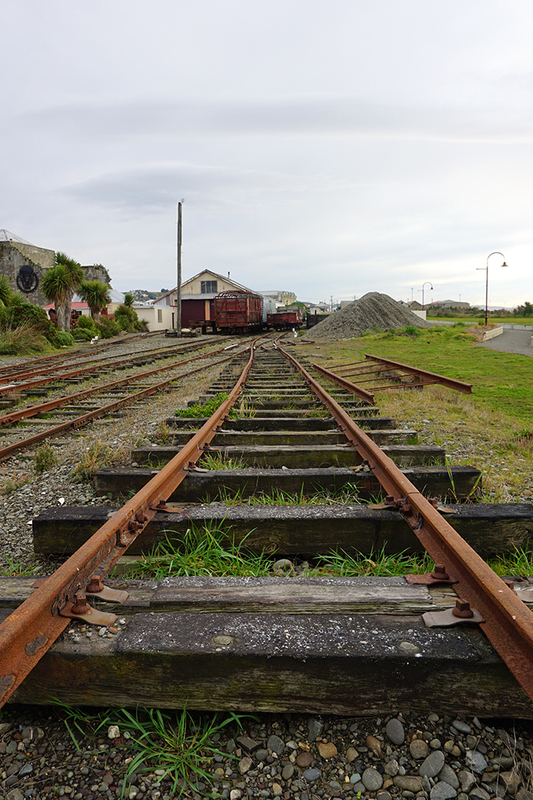 Old railway machinery rusted away. I snapped, snapped, snapped away. Every turn I fell in love with the grungy-ness, the weathered beaten sturdiness of the buildings. 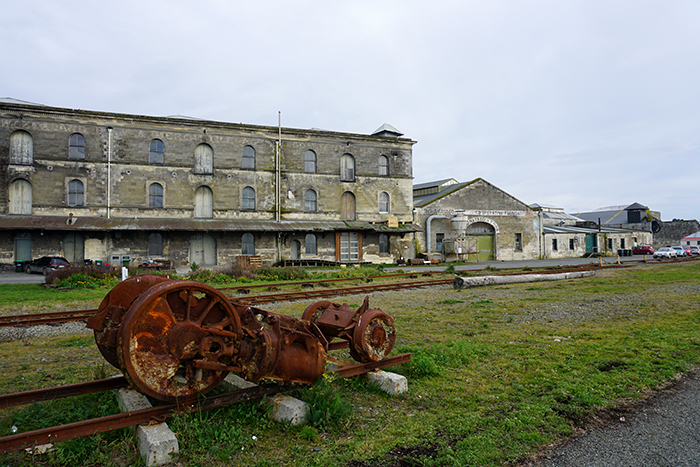 The aching lonliness of the disused, once vital, infrastructure. It reminded me a lot of parts of England, like Cornwall maybe? 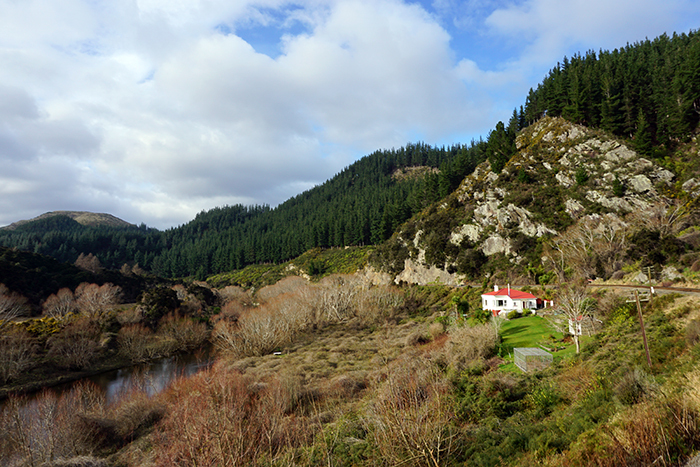 The local tourism authority has done a good job of historical preservation balanced with just the right amount of visitor infrastructure and information. 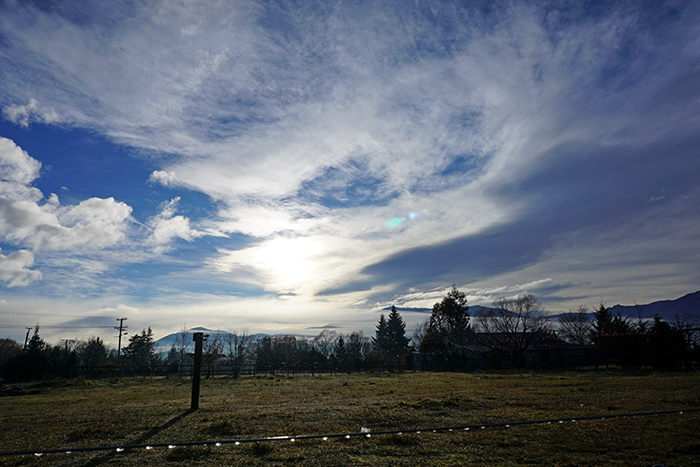 Too much and it ruins the atmosphere; but here, it is just enough. I stayed for half a day before feeling like it was time to get in the car. If I had all the time in the world I would have been happy to linger. 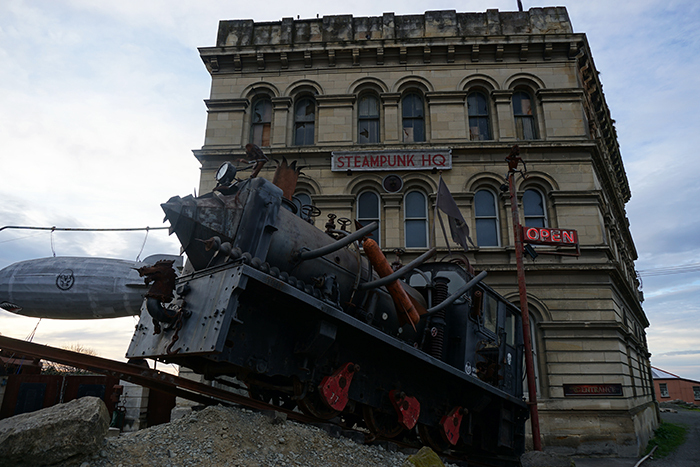 I could have gone to the Steampunk HQ museum, visited the little penguin colony, explored more of the local cafes, but as it was I think it was enough. 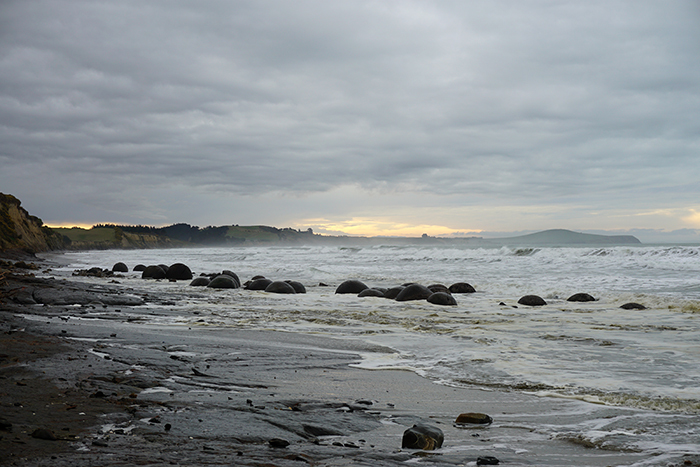 I hopped in the car and headed toward Dunedin with my heart set on stopping to see the Moeraki Boulders on the way. 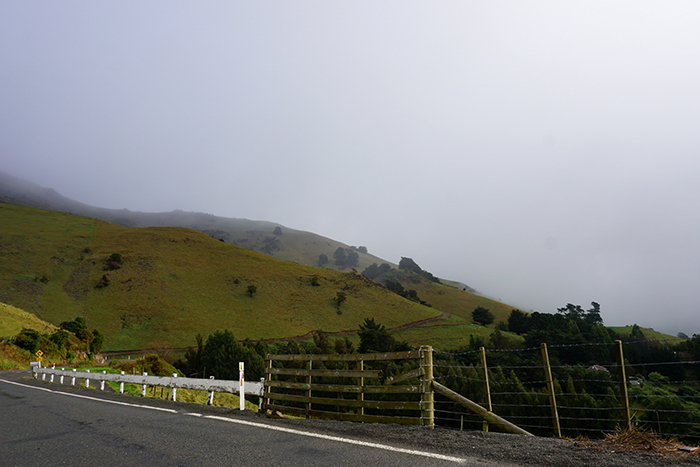 Somewhere before I came to them I followed a signpost to a lookout – I can’t even recall the name of it now, it was one of those whims you take while on the open road. 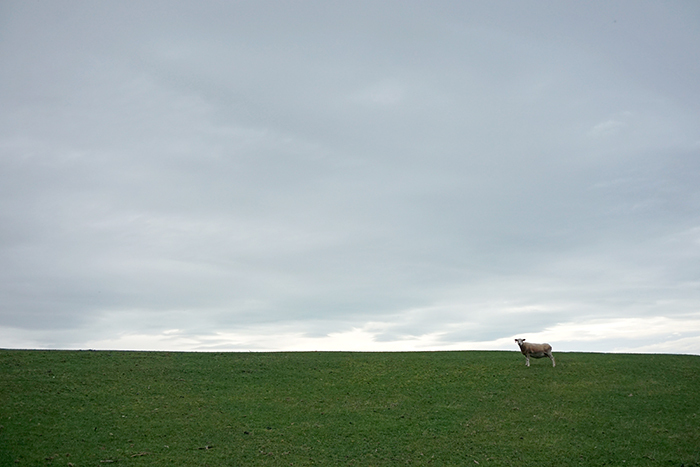 Anyhoo, wherever this place was, I met a lovely sheep. 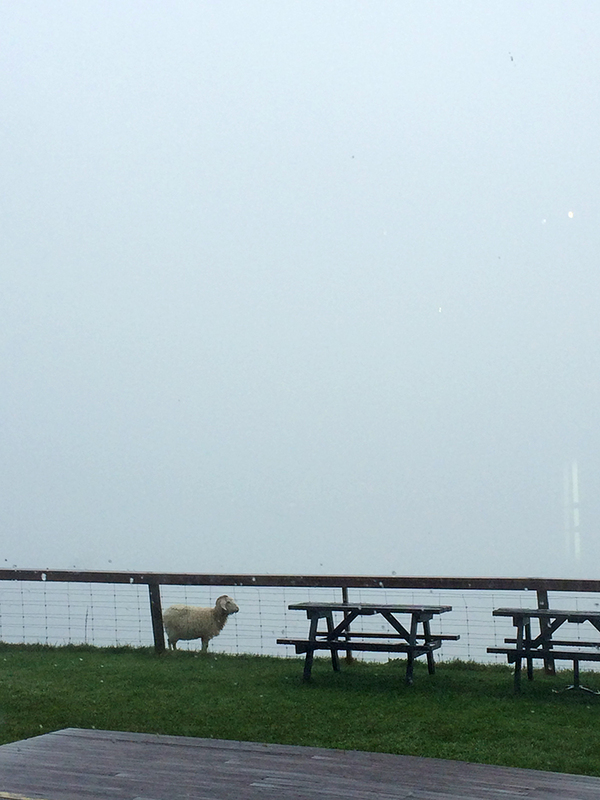 Check out the view he has, just beautiful! 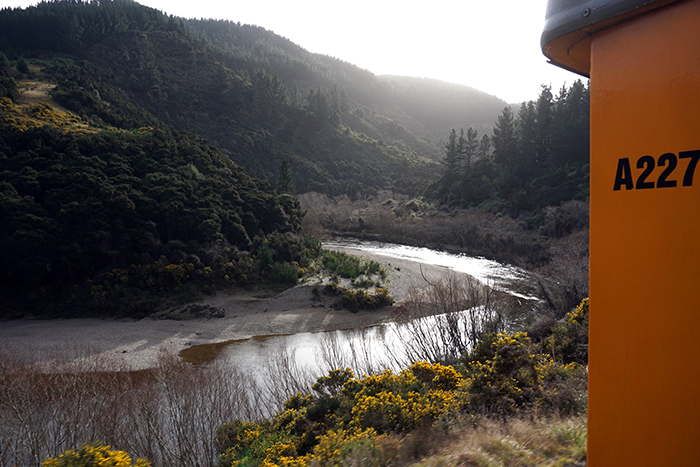 About half an hour down the road I followed the turn-off signs and parked near the Moeraki Boulders Cafe & Gift shop. 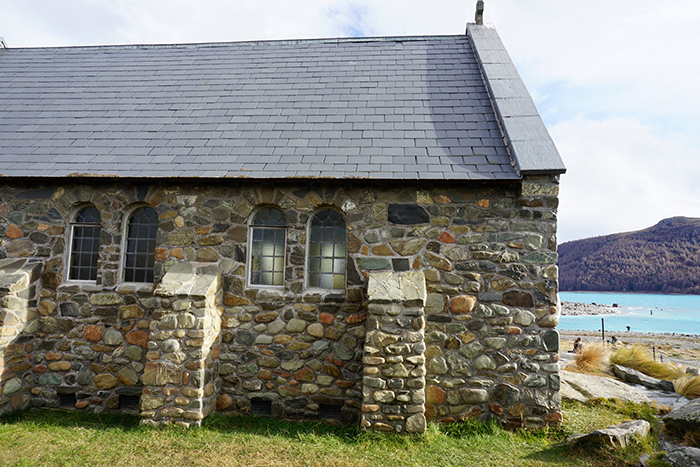 There is a direct access staircase to the beach directly next to the boulders which is signposted for patrons of the cafe only. 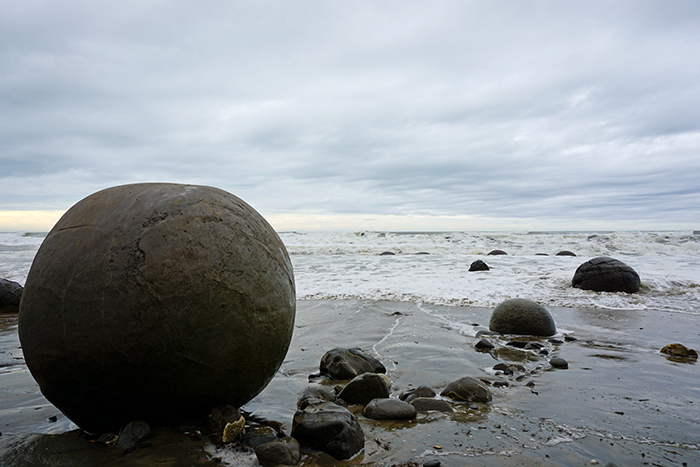 I headed down to take a look at these marvelous mega-pebbles (I made that term up). The boulders started forming over 60 million years ago on the bottom of the ocean, and over the course of time ended up on shore. The biggest ones are 3 metres in diameter and weigh over a tonne. No wonder they aren’t floating off into the ocean! It was cool to spend some time walking along the beach watching – and dodging – the waves as they crash over the boulders, keeping them smooth and rounded. 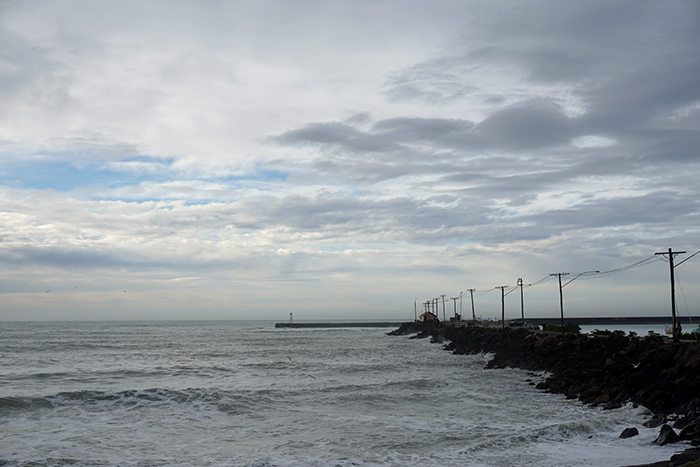 It started to rain after I had taken about a hundred photos so I climbed back up the stairs and took shelter in the cafe, had lunch and watched the ocean from the window. I wrote out some postcards as I lingered over a coffee. Solo road trip at it’s best. In my own time, in my own way. 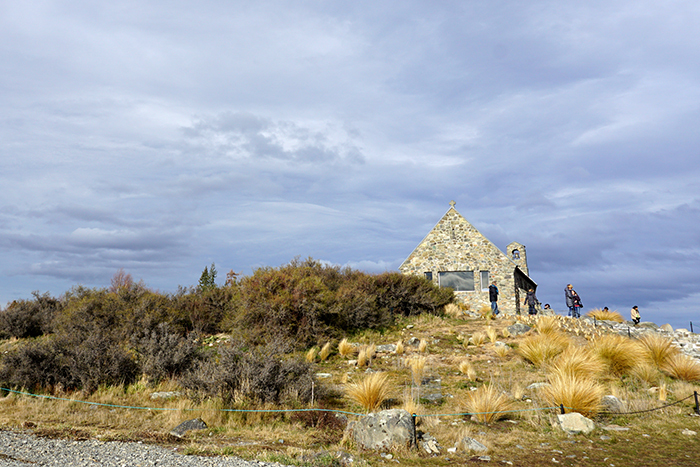 The drive from Omarama towards Lake Tekapo was really beautiful – some of my fave photos from the trip were taken then, either standing on the side of the road by the bus, or from my prime position for the drive – in the front seat! Early mornings sure are my fave. 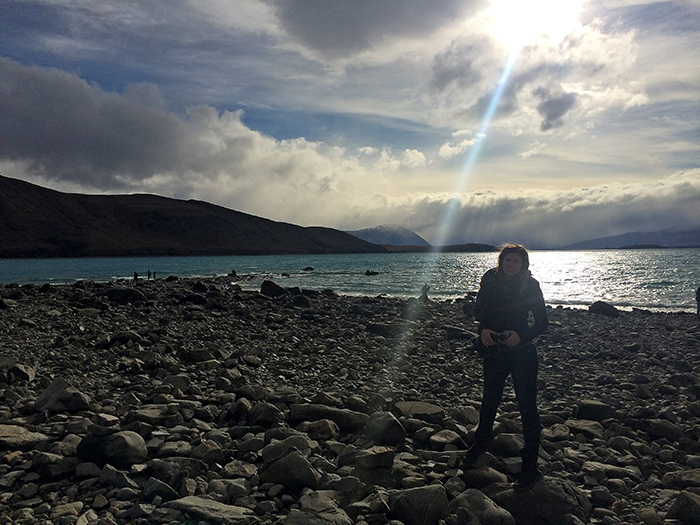 We approached Lake Tekapo and saw it shining a beautiful blue turquoise colour! 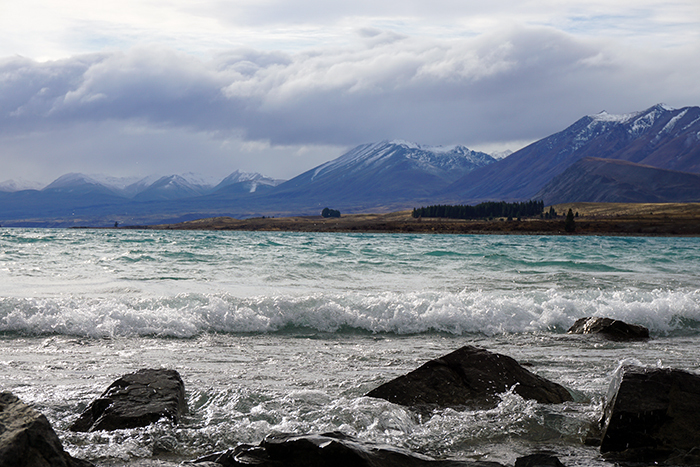 Even on a cloudy day the colour was so vibrant, it comes from the sediment of fine rock ground up by the glaciers. 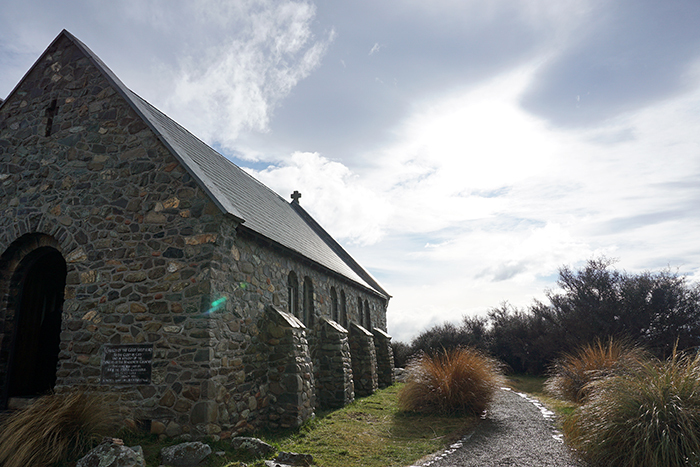 Sitting pretty by the lake is another of New Zealand’s most well known sites – the Church of the Good Shepherd. 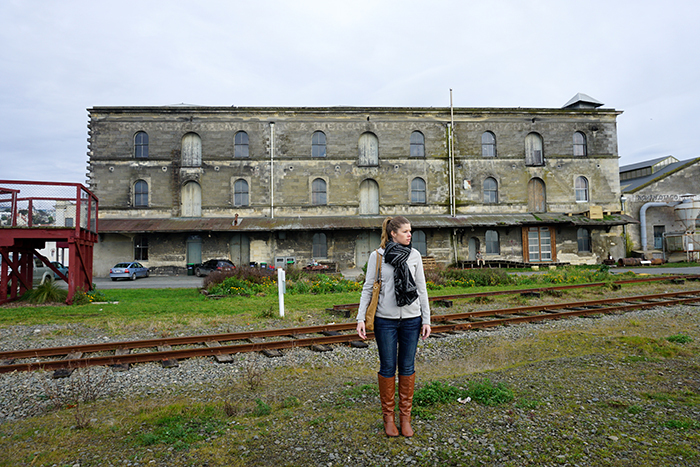 What a sweet building in an amazing location! It’s a shame there are so many people around (haha, darn tourists) as it’s hard to get a clear shot, but even the crowds don’t detract from the calm and peaceful vibe. 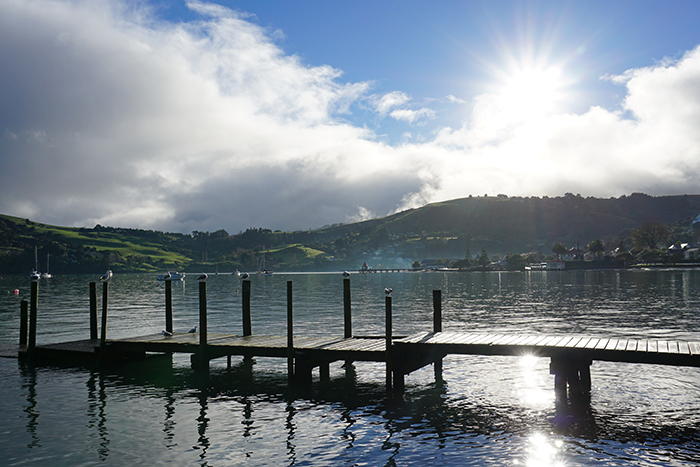 The water is stunning, something right off the front of a postcard – oh wait, this spot is definitely on a postcard! 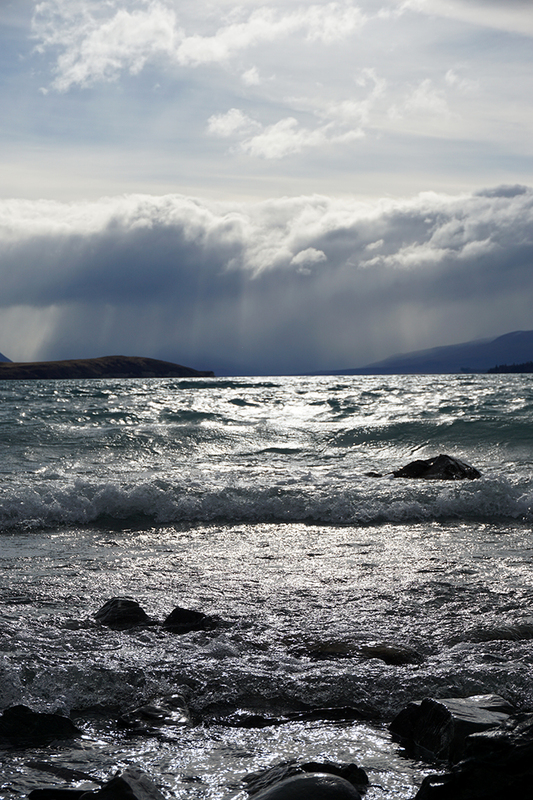 Across the lake we could see rain clouds teeming with a downpour… ahhh nature! You are really something!! The lakeside reminded me of places I’ve been in England, such as around the Cornwall area. 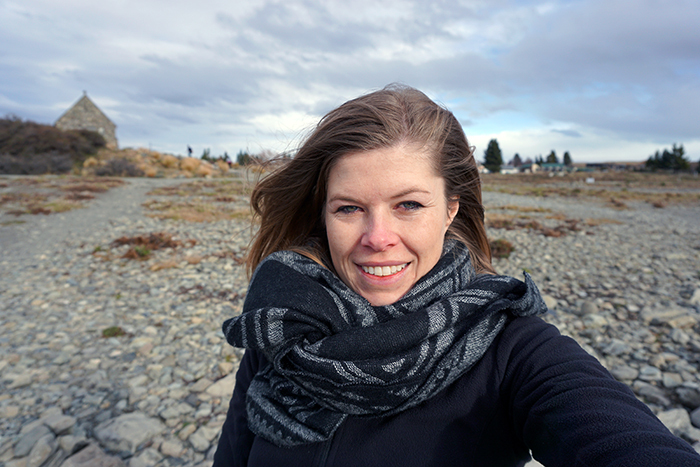 With the cloudy sky, the chilly bite in the air, and the wind whipping my hair and causing my eyes to stream (look how bloodshot they are, I’m squinting to keep them open!) So different to beaches at home in Sydney, but beautiful in its own way. 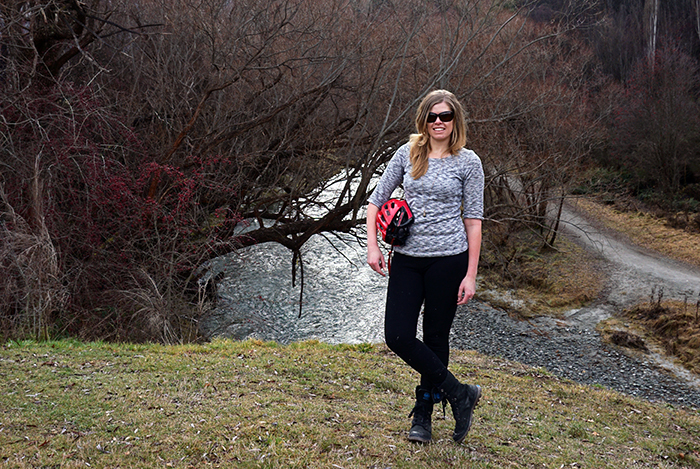 It was a great spot to work my photographer magic (haha, well I try). 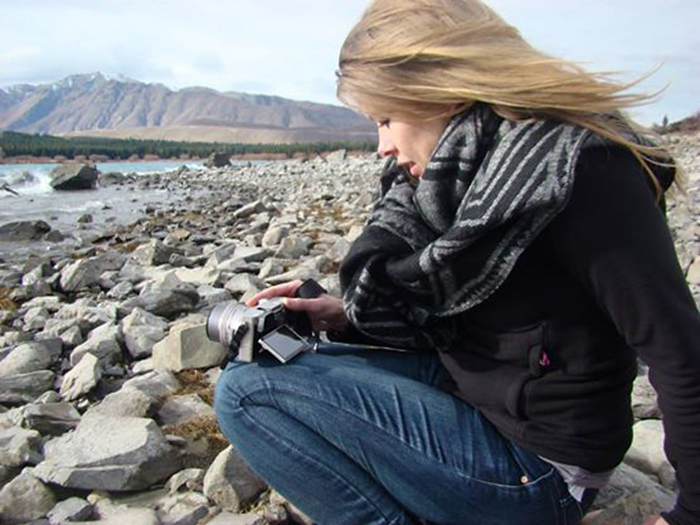 My friend Susie got a shot of me in concentration trying to get a level shot of the lake. 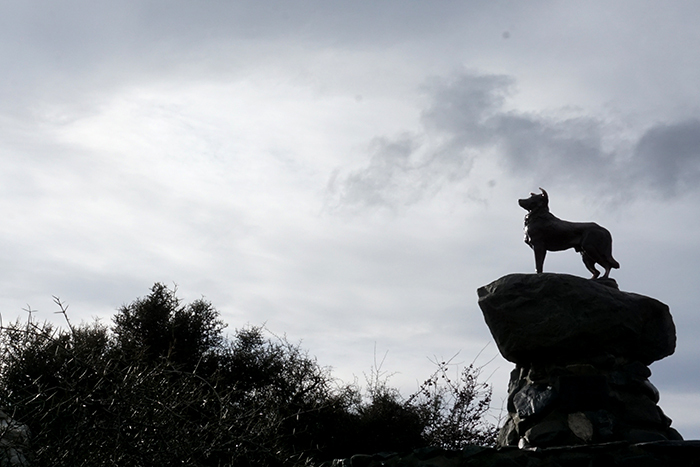 A short walk along the lake away from the church is a bronze statue of a Border Collie dog, it was erected in the 60s in honour of the working dogs in the sheep industry in the area. 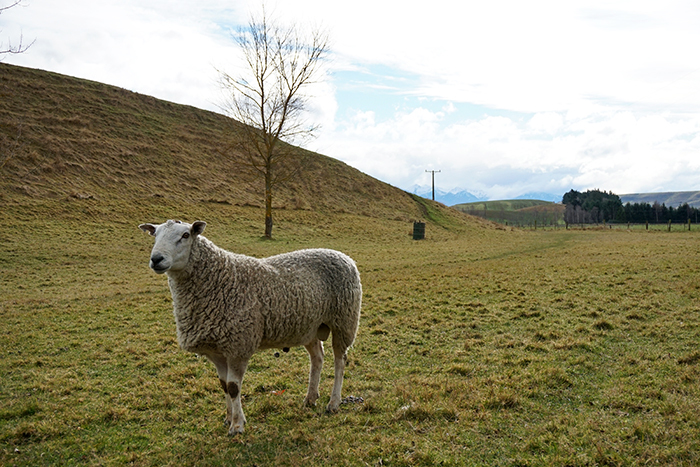 Seeing as we were in the heart of New Zealand’s sheep farming land (yeah I thought that was all of NZ too!) 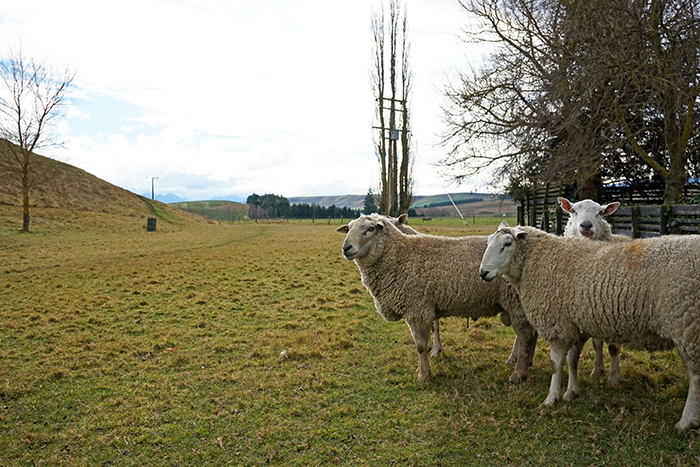 we then went to visit a sheep farm. 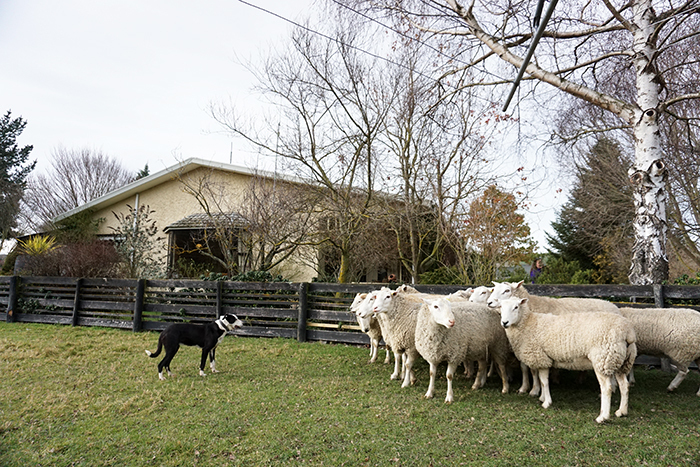 It was a wonderful opportunity to see a working farm – the sheep are cute, but so are the Border Collie dogs who totally run the show. 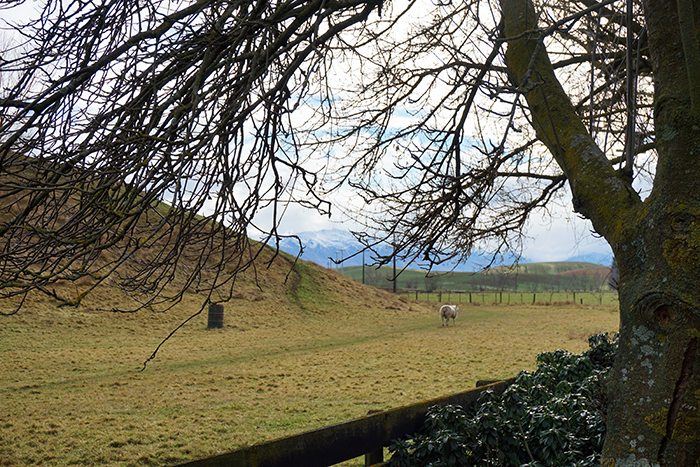 The farmer gave the dog an order and off he went to round up the sheep, who came trotting home from behind the hill. And into the corner just as they were told to. I love them, they’re so docile and sweet. 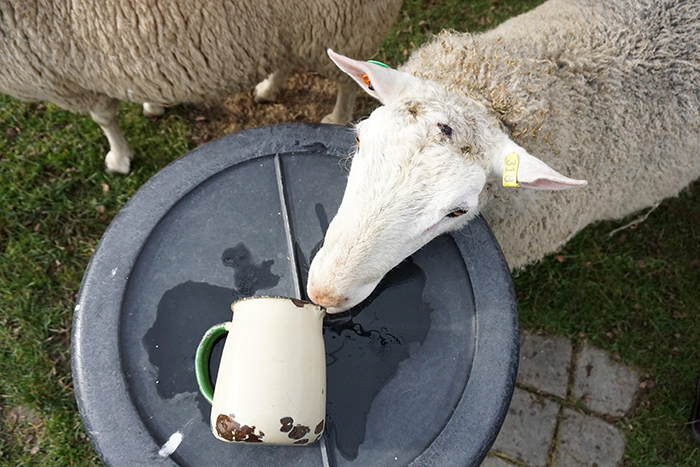 The farmer rewarded them with some milk, this guy was trying hard to get every last little drip. And then off he trotted, back to graze in paradise. 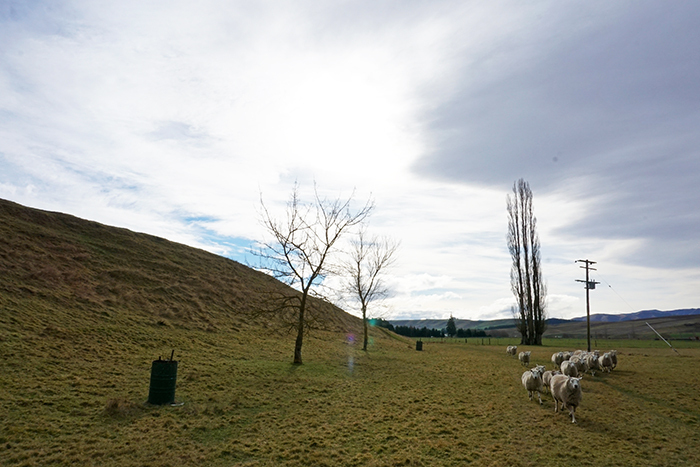 From here we continued on the last leg of the bus trip, crossing the Canterbury Plains back to Christchurch. 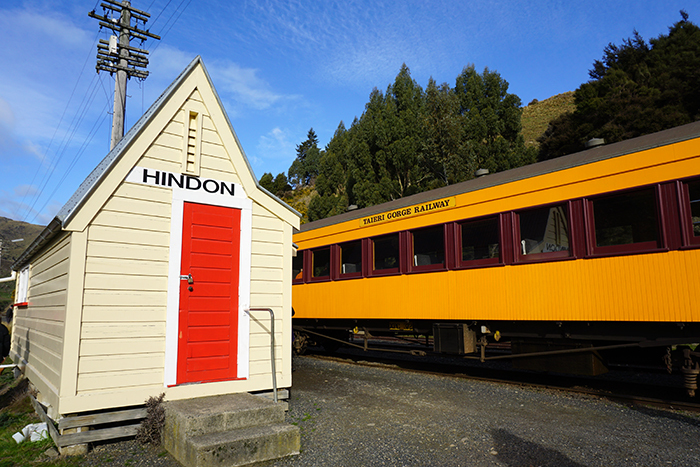 After a day spent mostly in the coach and on a boat looking, looking, looking at the untouchable rugged beauty of Fiordland, it was rather refreshing to find ourselves the next day in Arrowtown, in the Otago region. This lovely little town has a wonderful village-vibe going on with some great cafés and stores to wander around. 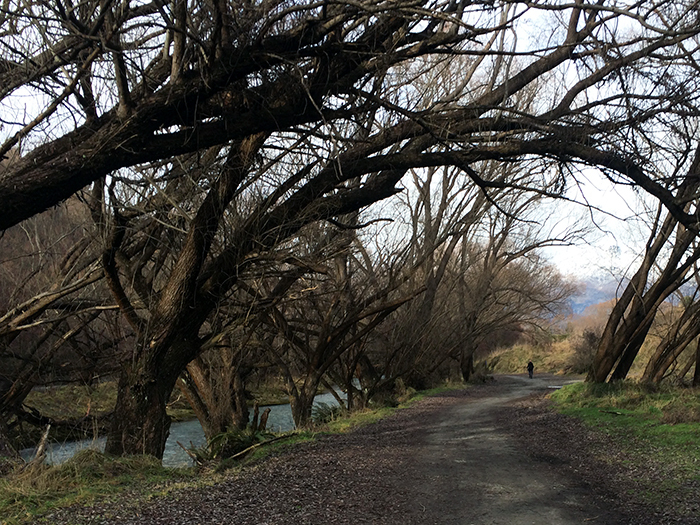 It’s also a good place for a bike ride, with a great cycle path along the willow-lined Arrow River. 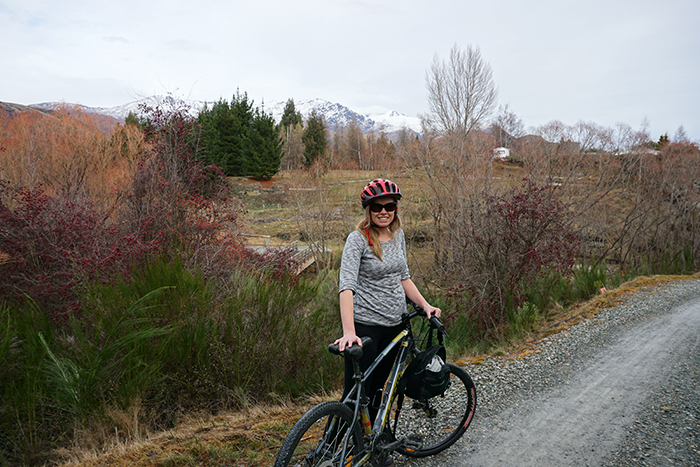 The point of the bike trip we went on was to head towards the Kawarau Bridge, traversing over river crossings, country lanes and apparently a pretty amazing suspension bridge. Apparently. Hmm. 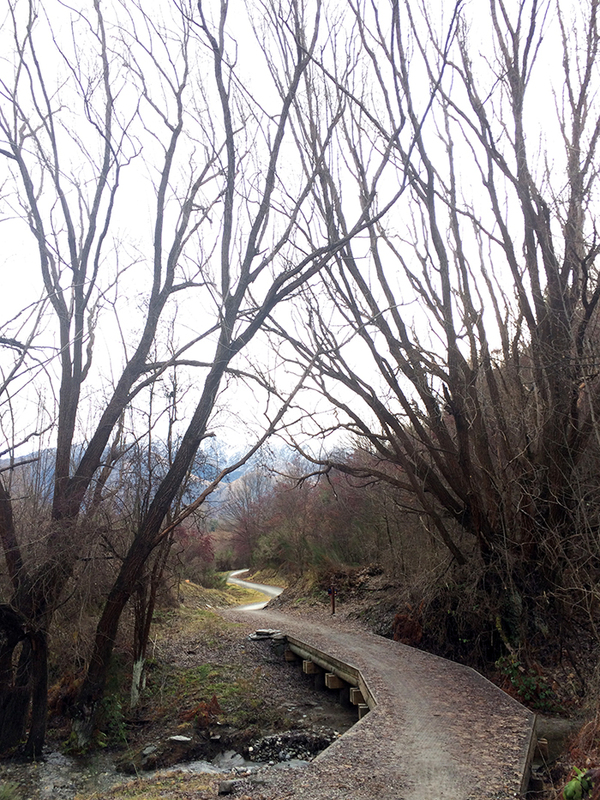 Due to some bizarre navigational instincts, myself and Gabriela, a girl I was riding with, somehow took a turn about halfway that took us back to the starting point…. Yeah. Not sure what happened. We were having a merry old ride. We even stopped for pictures. 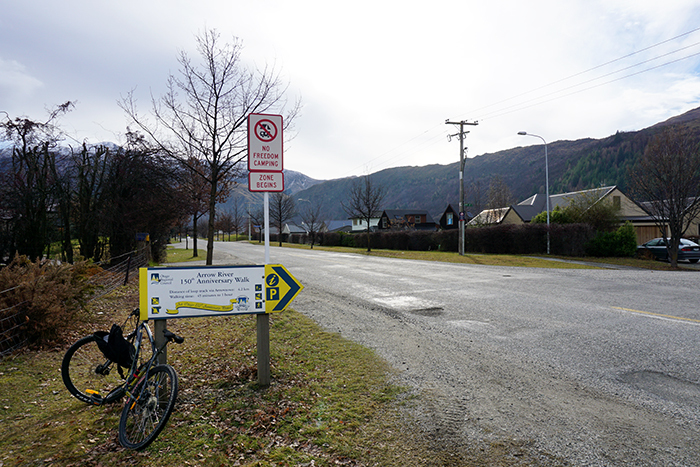 The owner of the cycle hire place was quite surprised, especially as we hadn’t even taken the same route back. 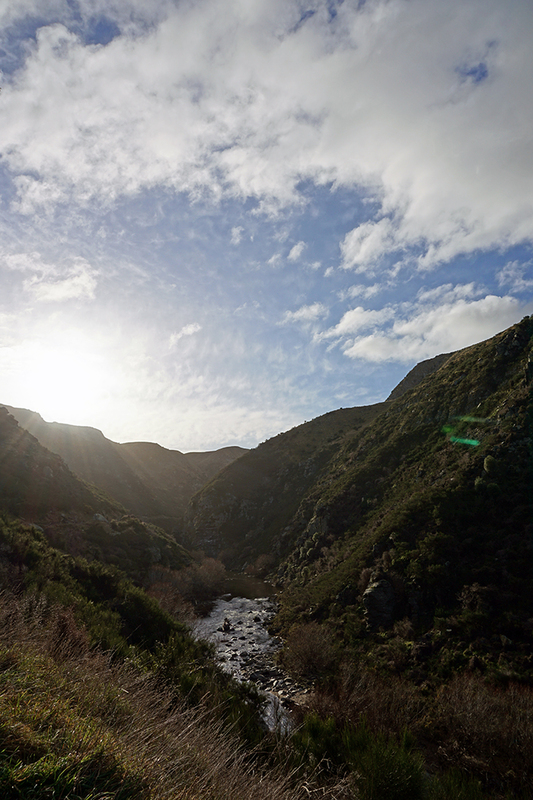 Sure we saw signs, but we thought it all looked OK.
And we were rather preoccupied with the scenery. 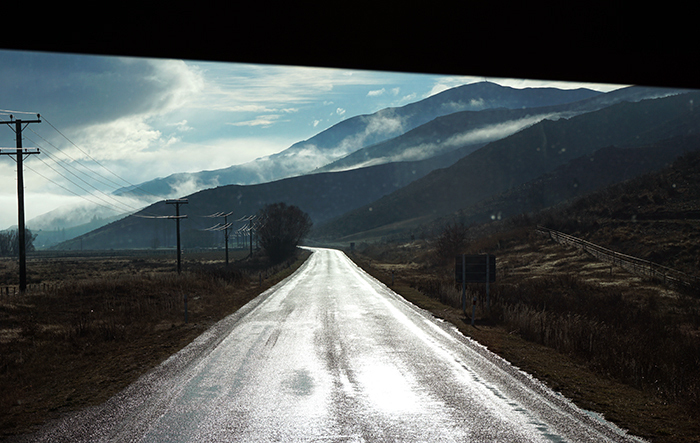 But anyhoo, we were kindly given a lift in the car to the Kawarau Bridge where the others were. 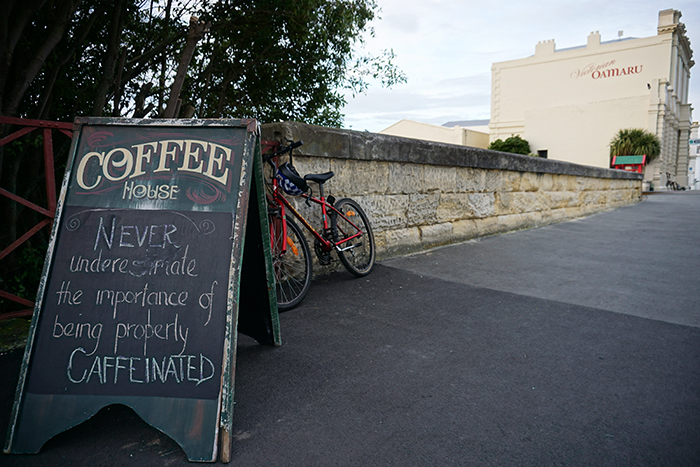 Bit embarrassing, but mostly disappointing as we missed out seeing the suspension bridge, but sometimes things just don’t work out, and that’s OK.
We had fun on our bike adventure, and seeing as we didn’t even realise we were on the wrong track til the very end… well – no harm done lol.